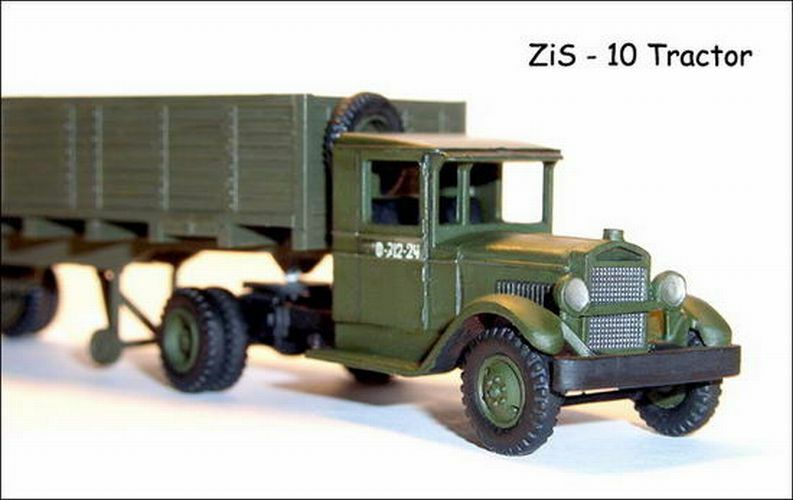 Zis-5 was began produce in October 1933. 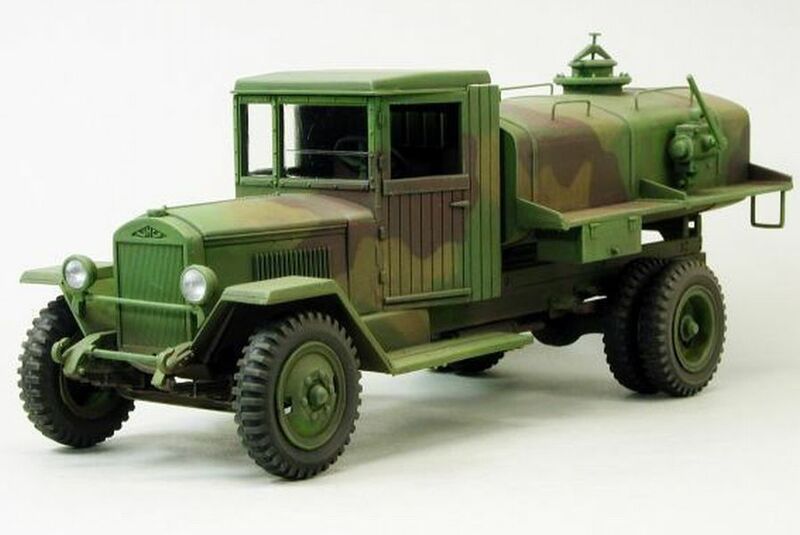 In the 1934 Turkey bought 100 lorries Zis-5 (It was the first Soviet car export), then these lorries start to buy Afghanistan, Iraq, Iran, Spain, China, Latvia, Lithuania, Ethonia, Mongolia and Romania. 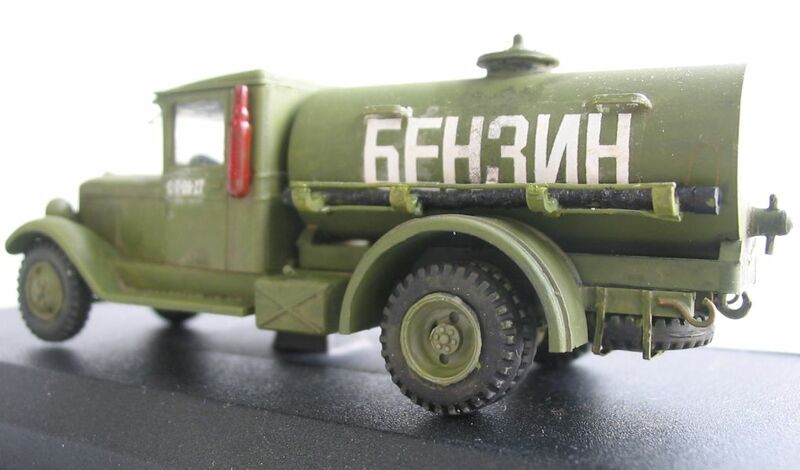 In the USSR the big amount of Zis-5 was used in the Army. 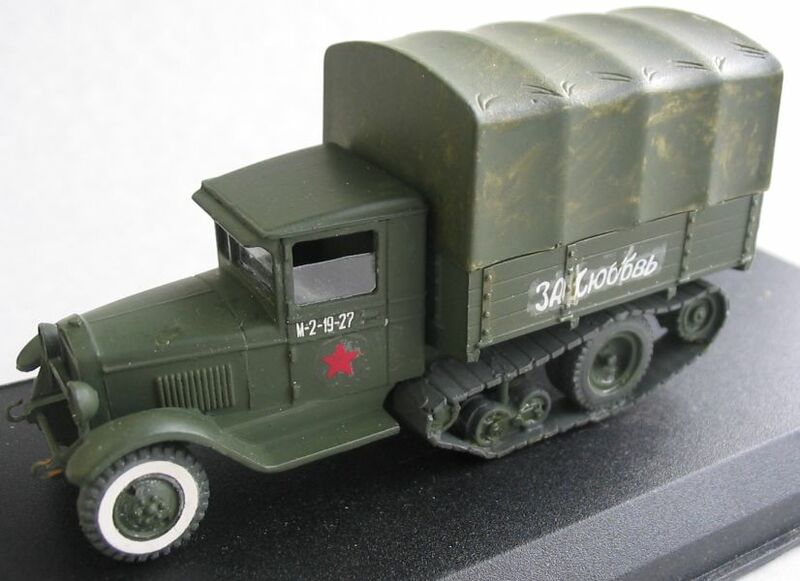 At the beginning of the Great patriotic War (on 22-06-1941) there were in Red Army 104200 lorries Zis-5. 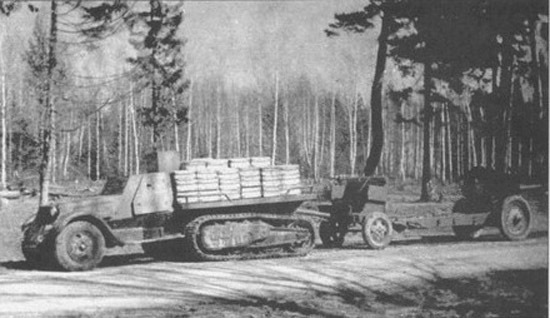 At the end of 1941 the war circumstances forced to change the construction of Zis-5. 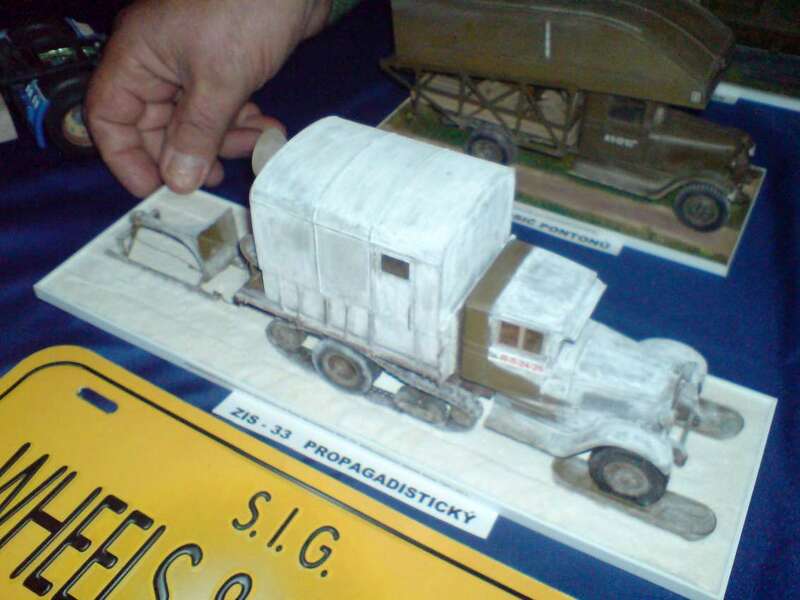 All changes had the goal -to make the lorry simpler for to economy deficit materials (thin steel sheets, chrome etc), to make cheaper and production, an reparation of lorries. 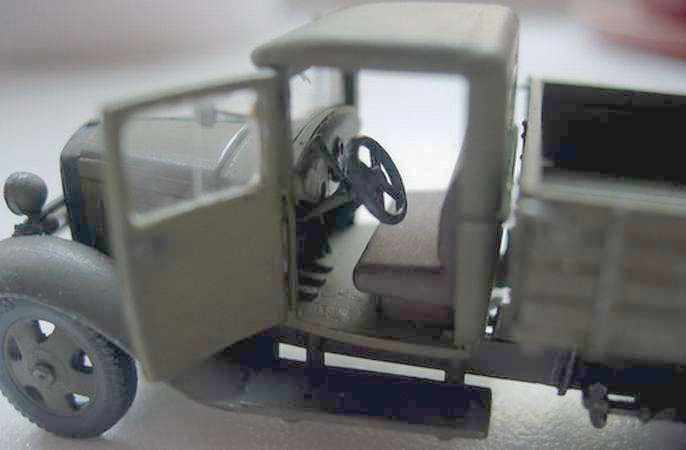 They replaced round stamped wings for bended welded ones, they began produce cabs and foot boards from wood: only rear board of the body was now a flap, front wheels had now no breaks, and only one left headlight was at lorry. 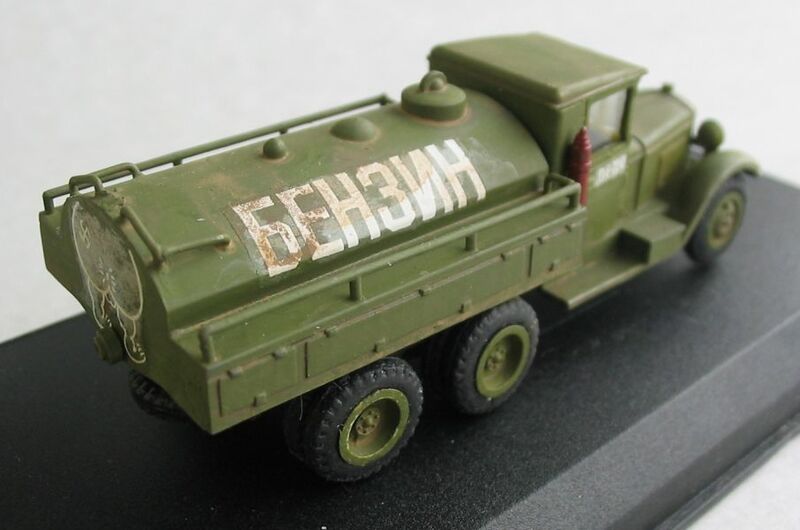 This simplificated model had got the denomination Zis-5V. 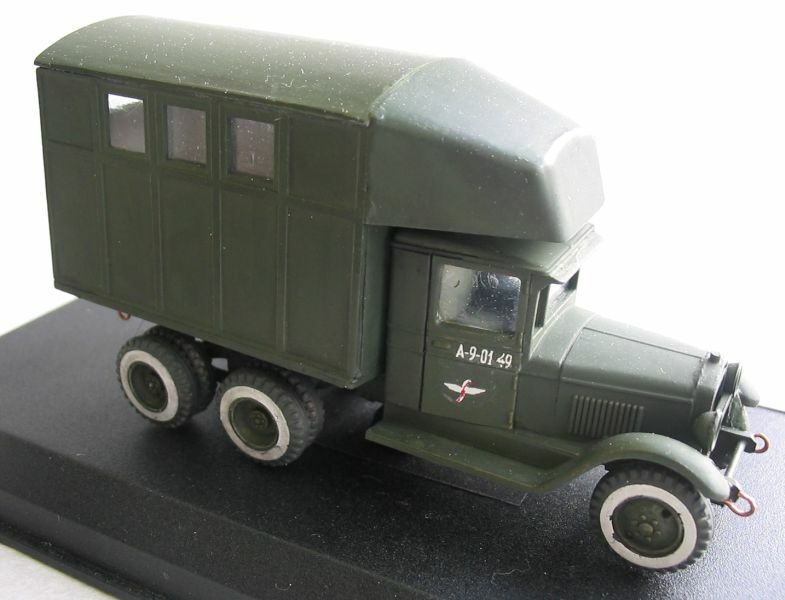 They began to produce it in May 1942 in Ulýanovsk, and later in Moscow and Miass. 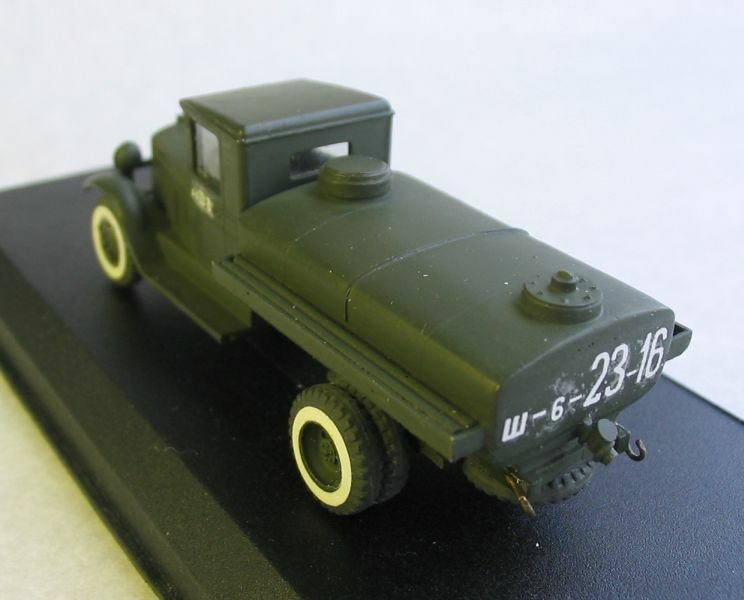 During the War years there were produced about 83.000 of Zis-5. 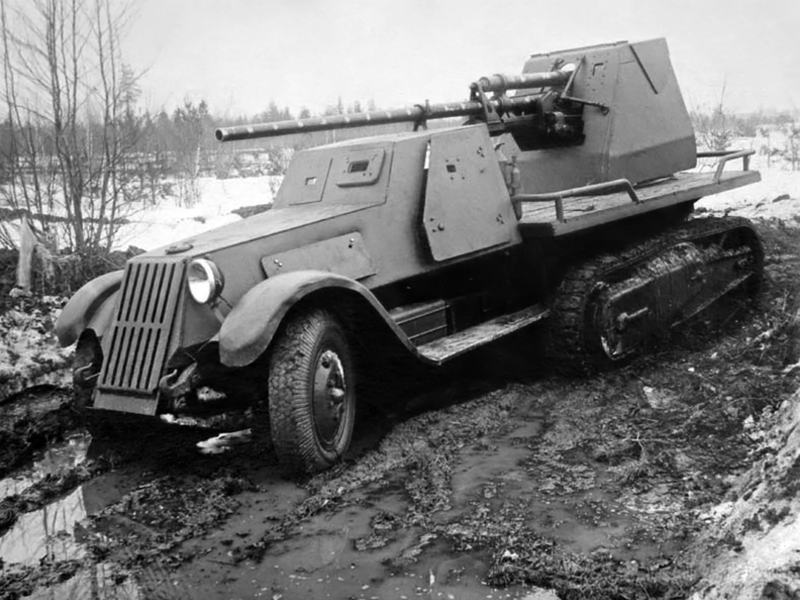 In the years of the War Zis-5 (Zis-5V) was used as a tractor of light artillery, for to transport loads and troops (in it's body of five benches could seat 25 soldiers). 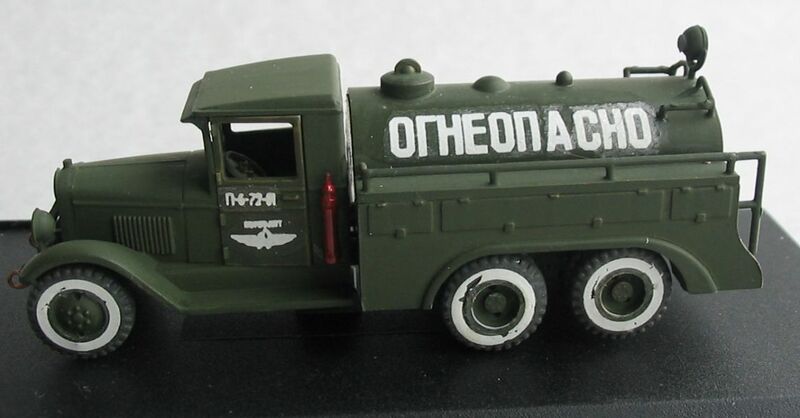 They were used on all the fronts of Great patriotic War. 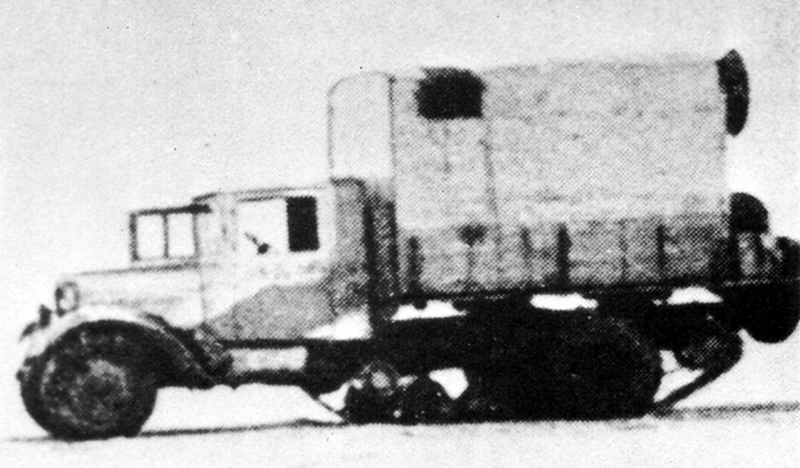 This lorry served the heavy service on the "Road Of The Life" -it was the way from the beleaguered Leningrad through the ice of Ladoga Lake. 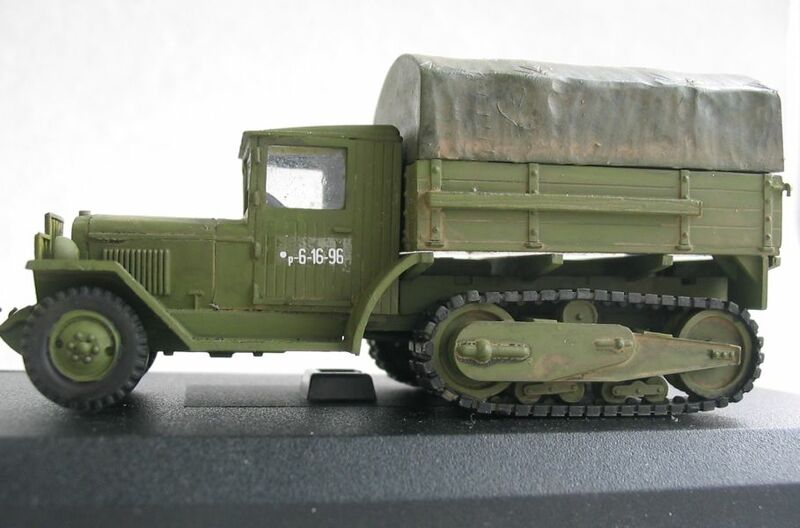 Between all the lorries of 3-tons class of type 4 x 2 which were used in the Wra year in Red Army (including trophy ones and obtained according Lend-Lease ones) Zis-5 was remarkably simple and had reliable contruction, it had big repairing ability. 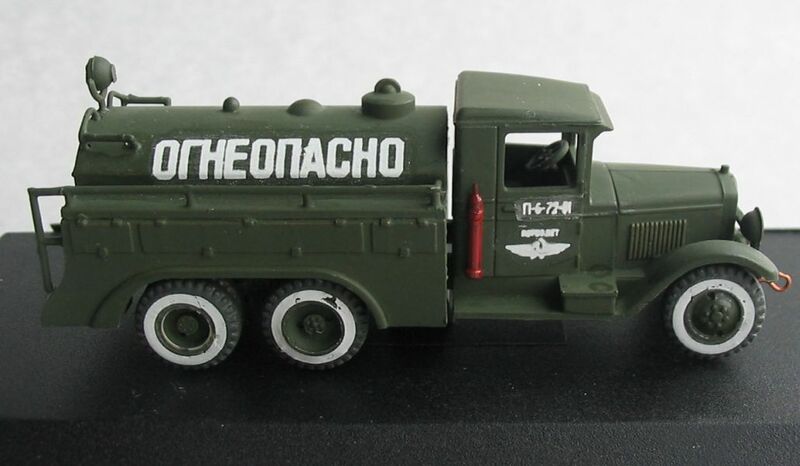 It was really the "Working Horse"of the War. 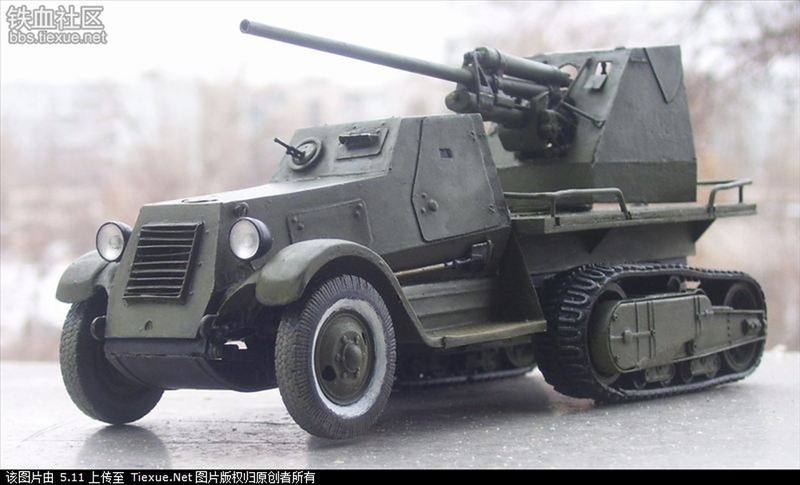 After the War they produced Zis-5 and developed on it's base models up to the year 1965. 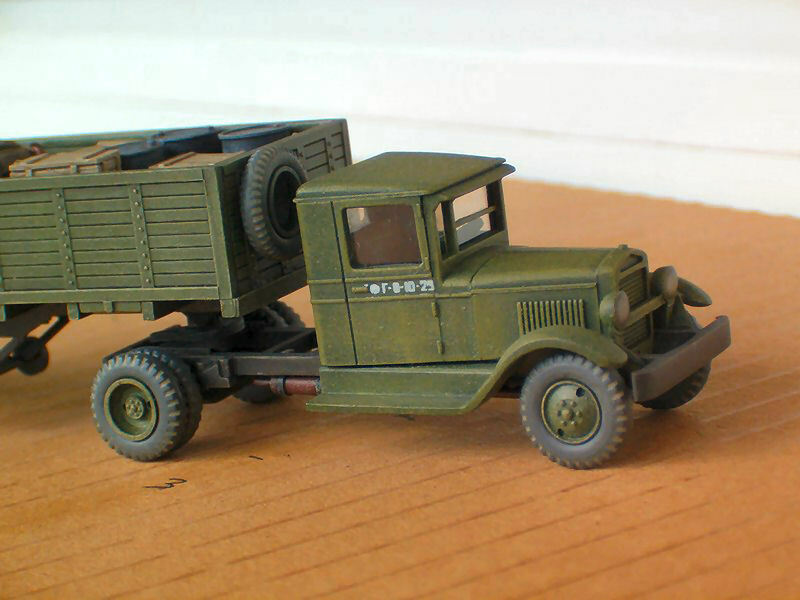 There were produced ca. 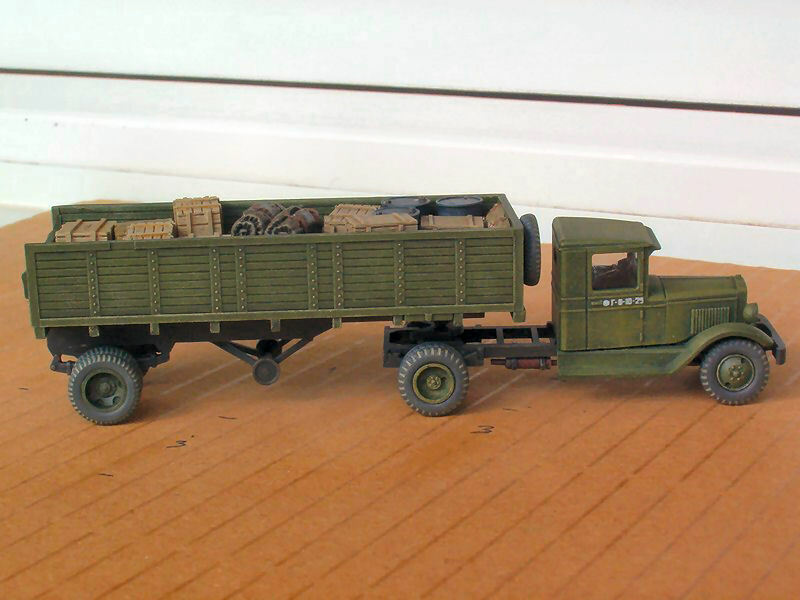 1 million of these lorries. 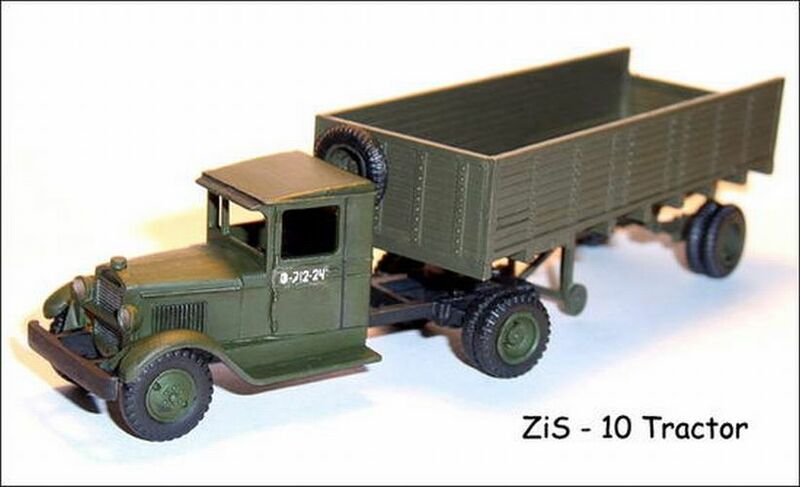 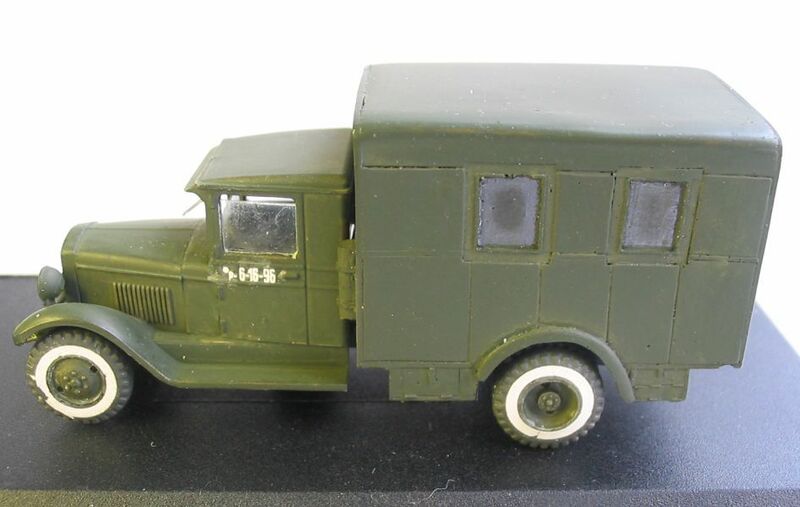 The Zis-6 is the three-axis version of the motor-lorry Zis-5. 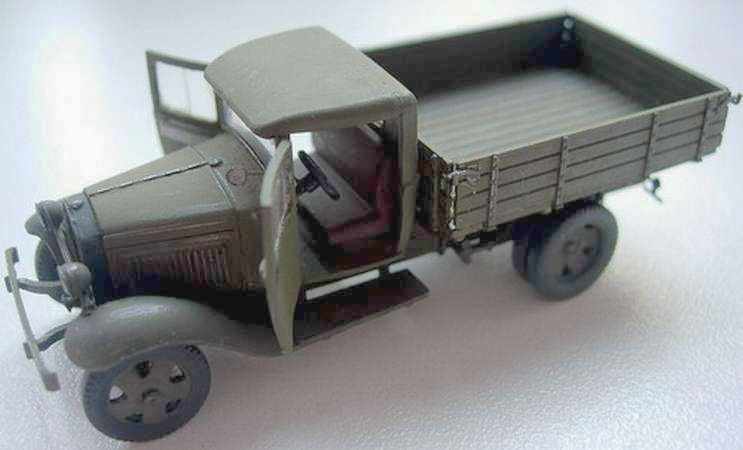 Its production was commenced in 1933, at the "Stalin Automobile Plant" and the production of the same was contineud up to October 1941, when the Plant was evacuated from Moscow. 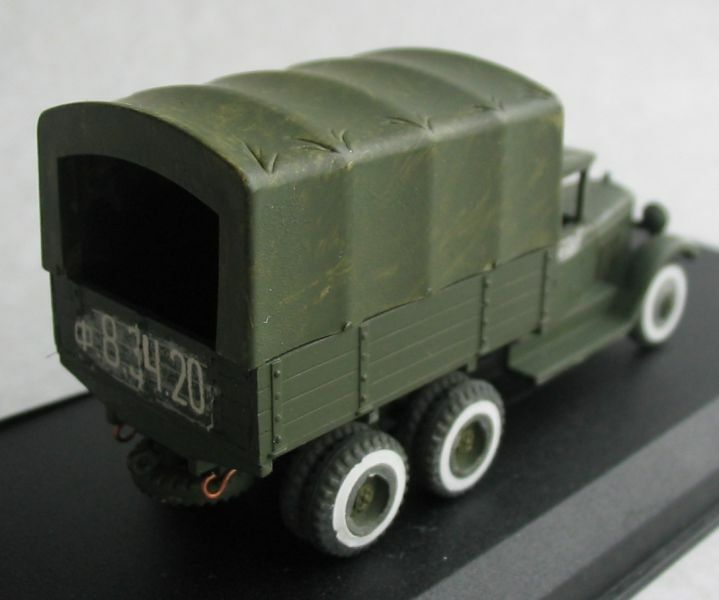 In total, 21239 motor lorries were Zis-6 were manufactured thet were intended for usage by the Red Army. 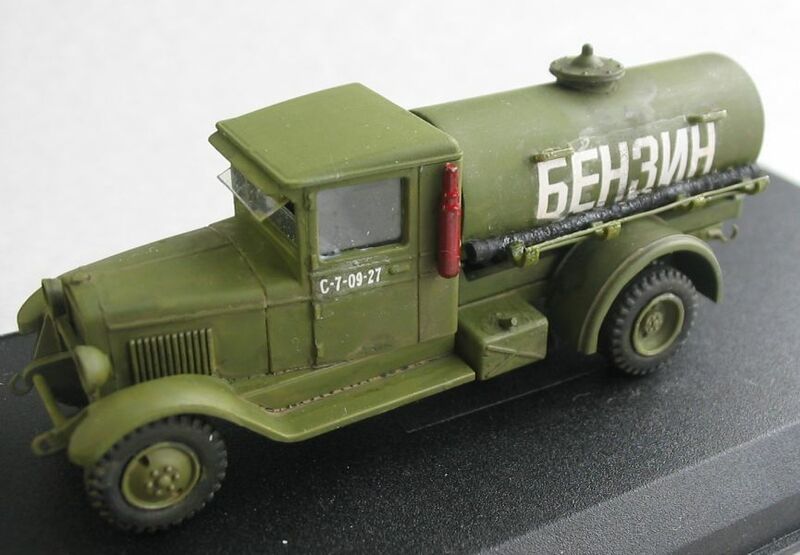 On the basis of the Zis-6 different application vehicles were being manufactured: petrol-refeullers (BZ-35, BZ-41), cranes (AK-3), mobil repair shops (PM-5-6, Parm), mobile power stations (AES-4), launcher vehicles Katjusha (BM-13, BM-8-36). 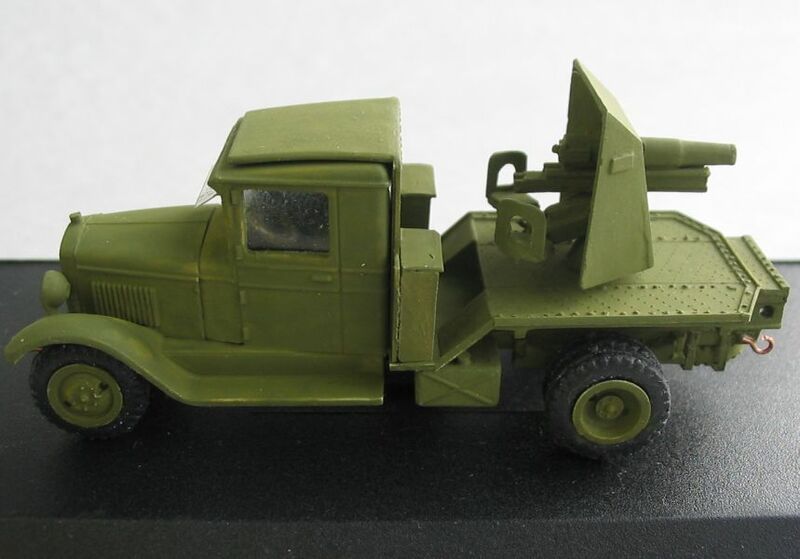 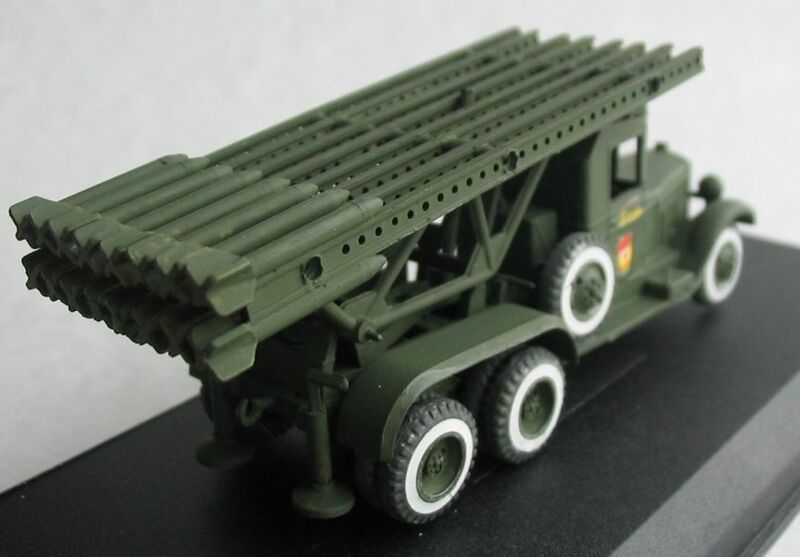 In general, during August-October of 1941, 456launcher vehicles BM-13 and 259 launcher vehicles done on the basis of the motor lorry Zis-6 were manufactured. 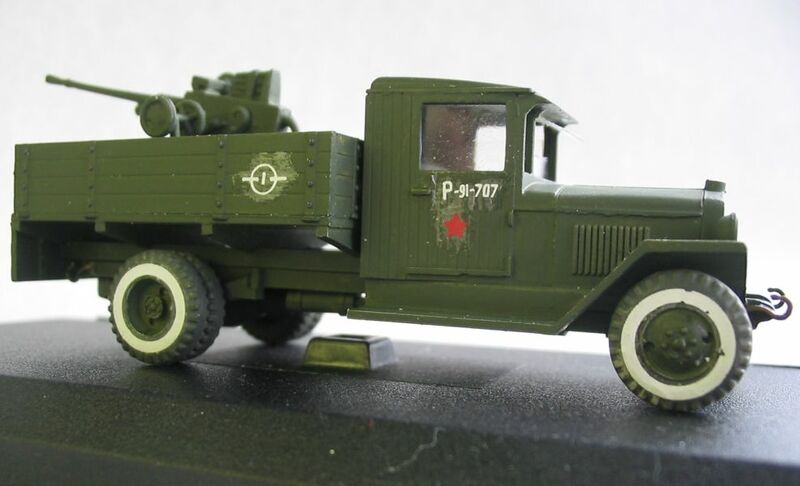 The first works on creation of the rocket weapons for the Red Army were begun by Soviet designers in 1938. 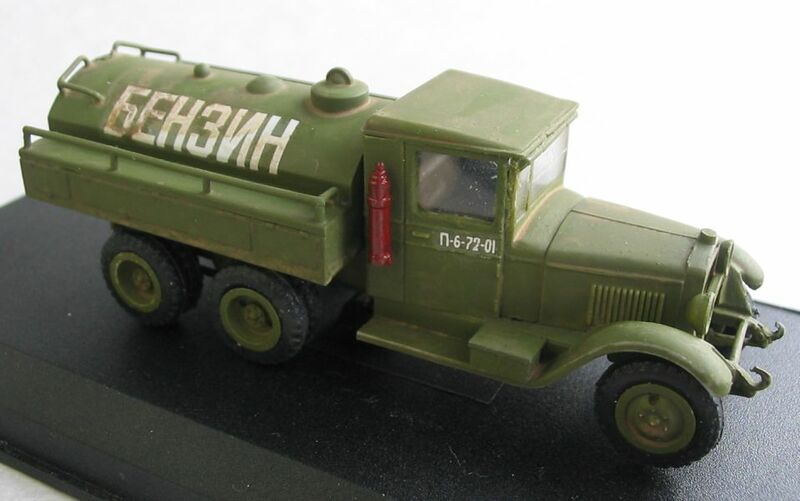 The decision on the production in series of reactive projectiles and launchers, as well as on creation of missile artillery was accepted by Soviet government on June, 21, 1941. 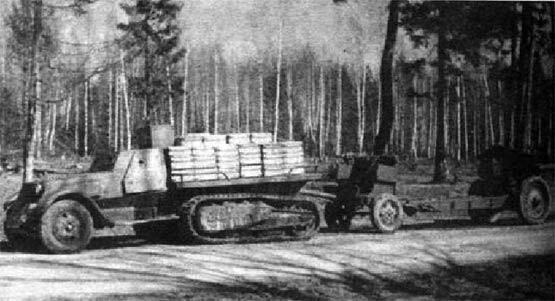 On July 14, 1941 the experimental artillery battery (7 launchers) under commanding of the captain I. Flerov for the first time has put impact on German Army at station Orsha. 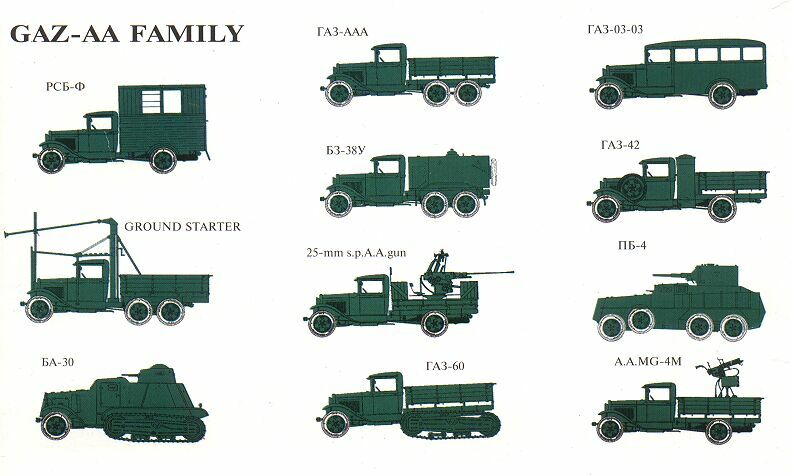 On August 8, 1941 first eight regiments of missile artillery (36 launchers in each unit) were created. 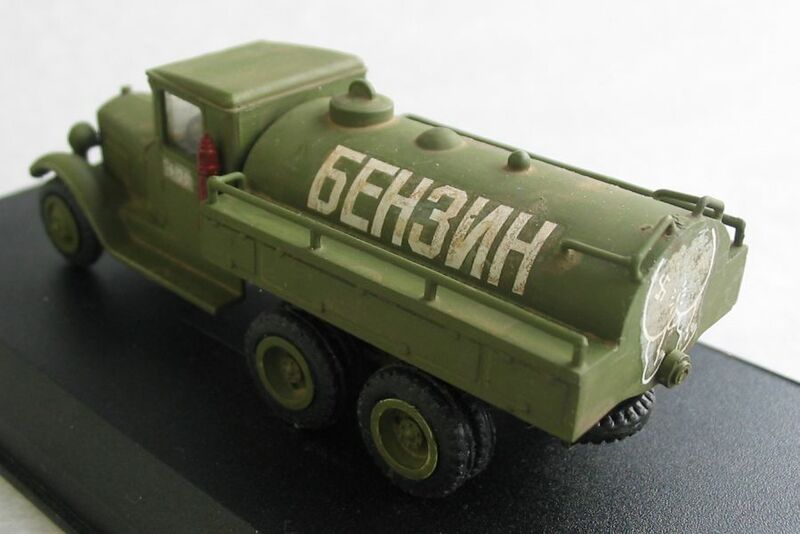 To ech so regiment was given the name "Guard mortar unit of the Reserv of the Supreme Main Command". 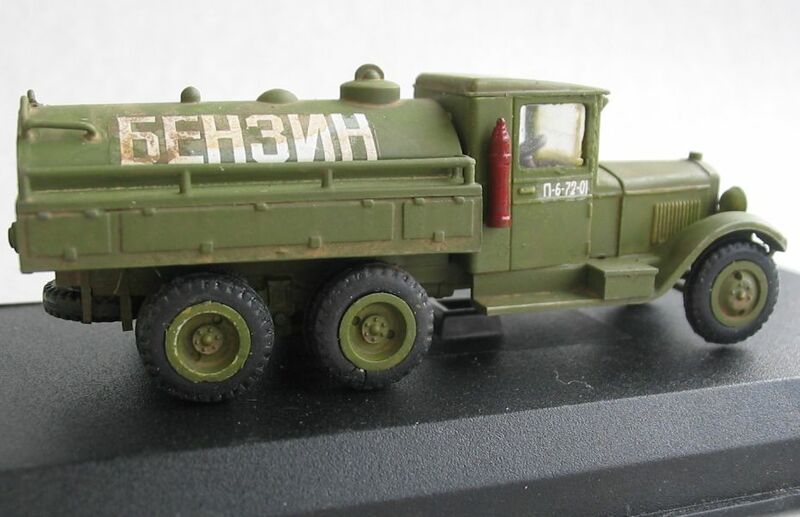 By this way the exclusive meaning of the missile weapon was emphasized. 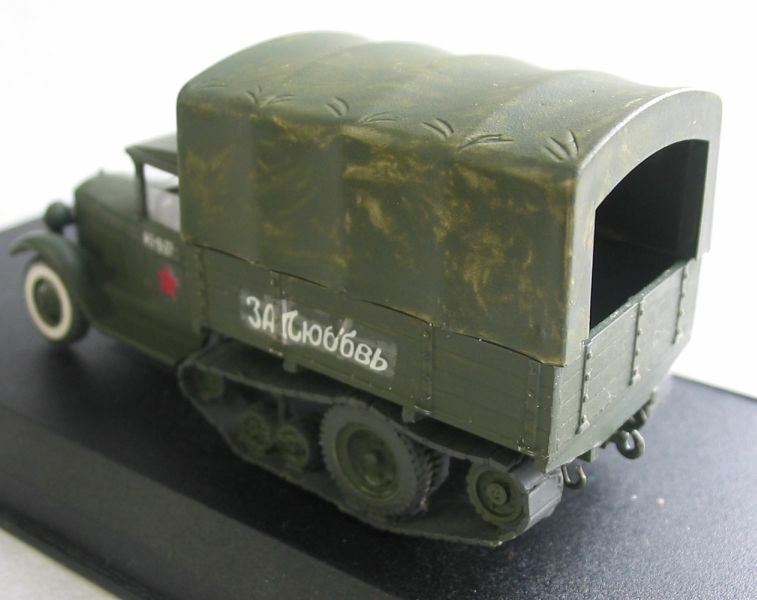 From first days of combat using at the front of reactive weapon it became most popular among soldiers of Red Army. 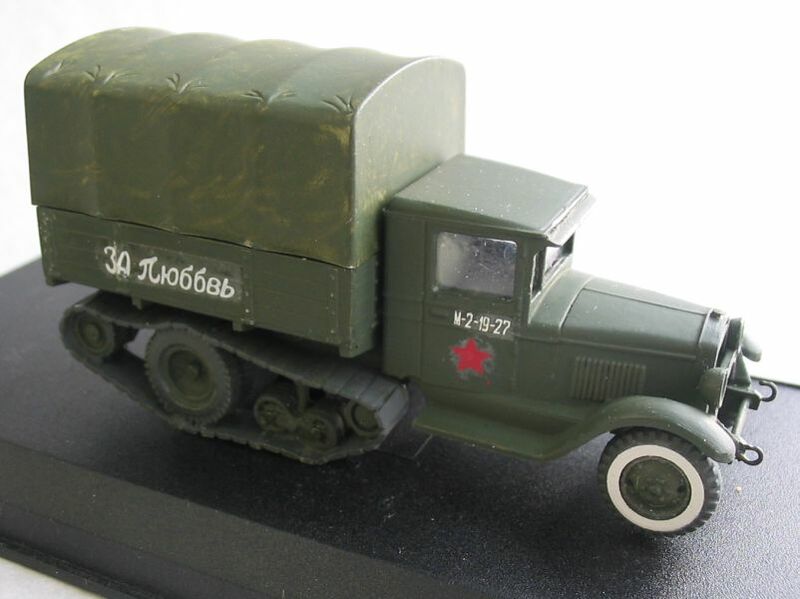 They began to name rocket launcher by female name "Katjusha". 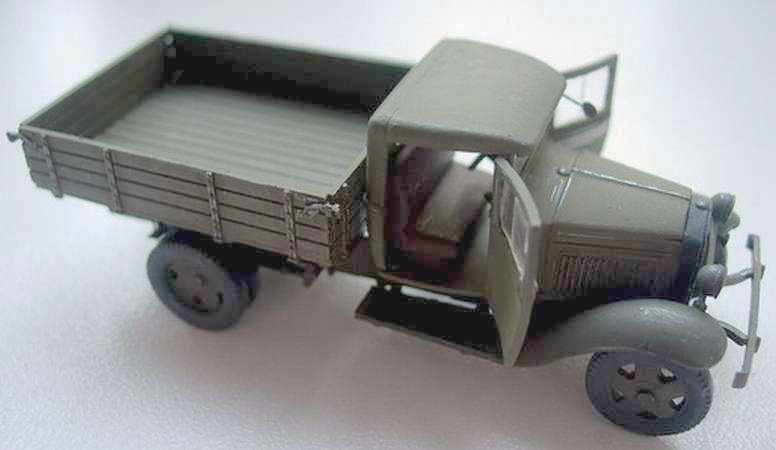 Among German soldiers this piece was named by "Stalin Organ". 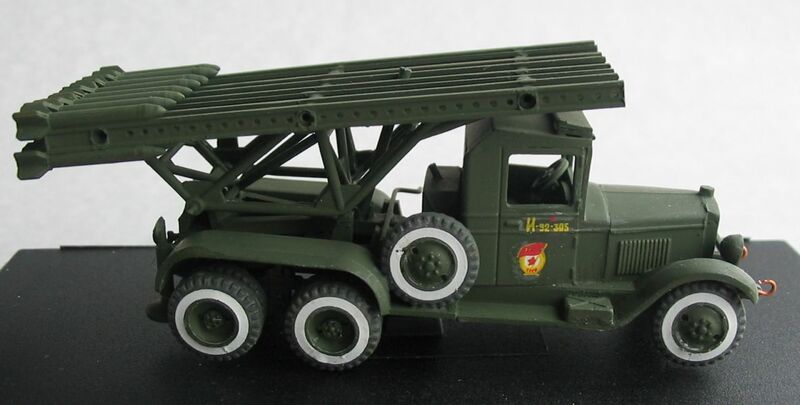 The rocket launcher BM-13N (normalized) was created in 1943 as a result of improvements of earlier type of launchers, so as: M-13, BM-13 and BM-13-16, and was misnamed in April, 1943. 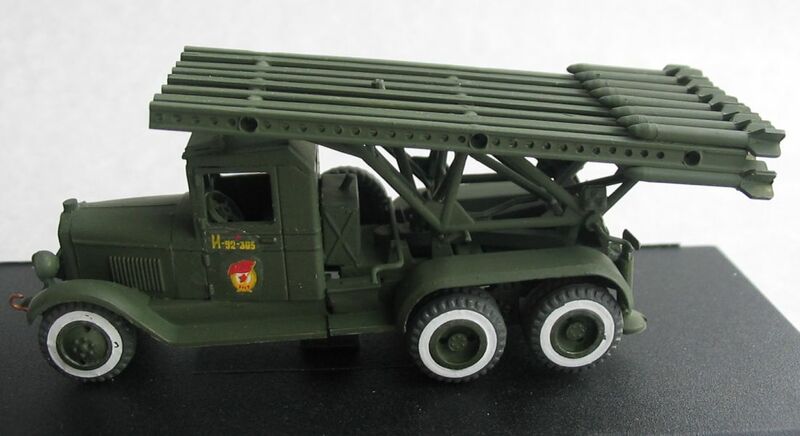 Up to the end of WWII more than 1800 launchers BM-13N were made. 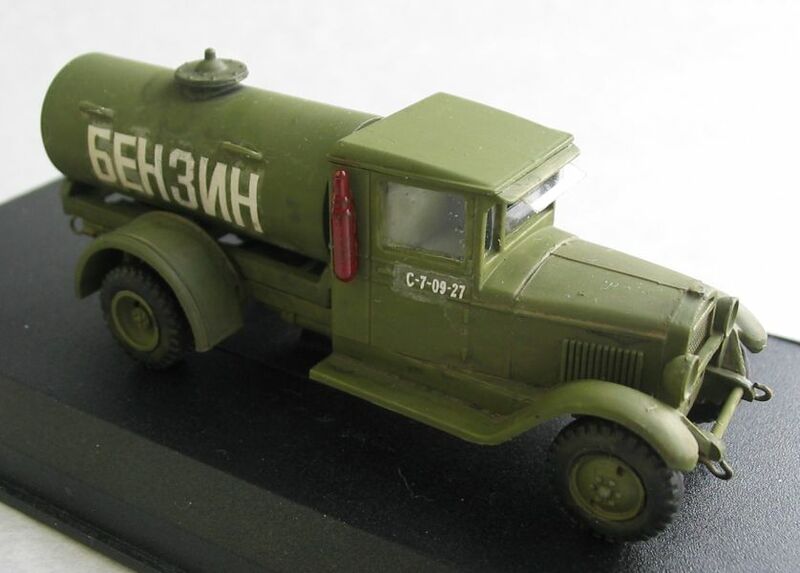 During the Great Patriotic War the missile artillery (including BM-13N) was widely applied by Red Army and has recommended itself by the extremely effective and reliable weapon. 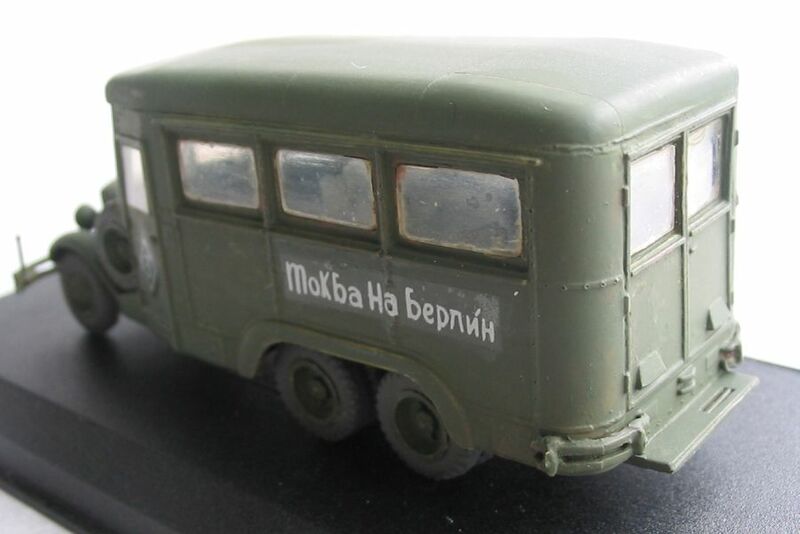 The sanitary car Zis-16S was produced in 1939-1944 and was created of passenger bus Zis-16. 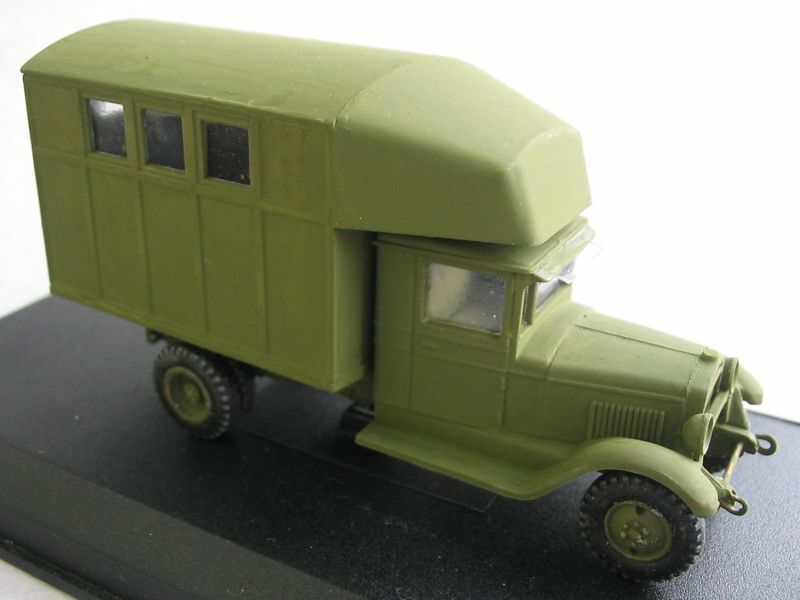 It had simplificated cabin from the lorry Zis-5 and cutted streamlined body of the base car Zis-16. 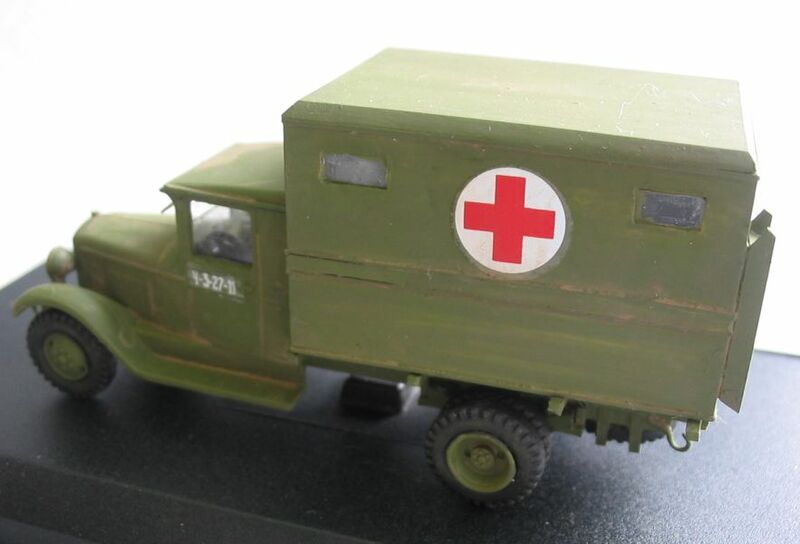 Internal machinery of its body was settled accouts with transport of a big number of wounded men. 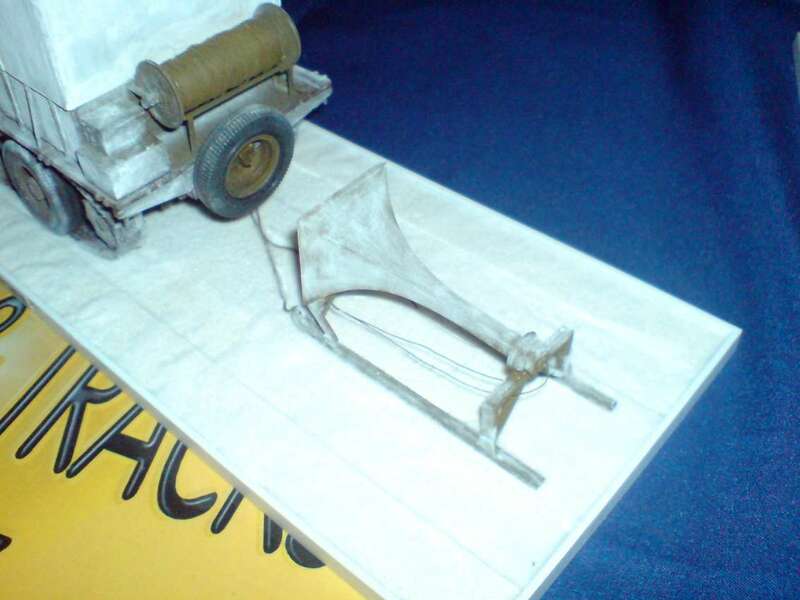 In front of the body were stretches in three lines (6 pieces), in the back -in two lines (4 pieces). 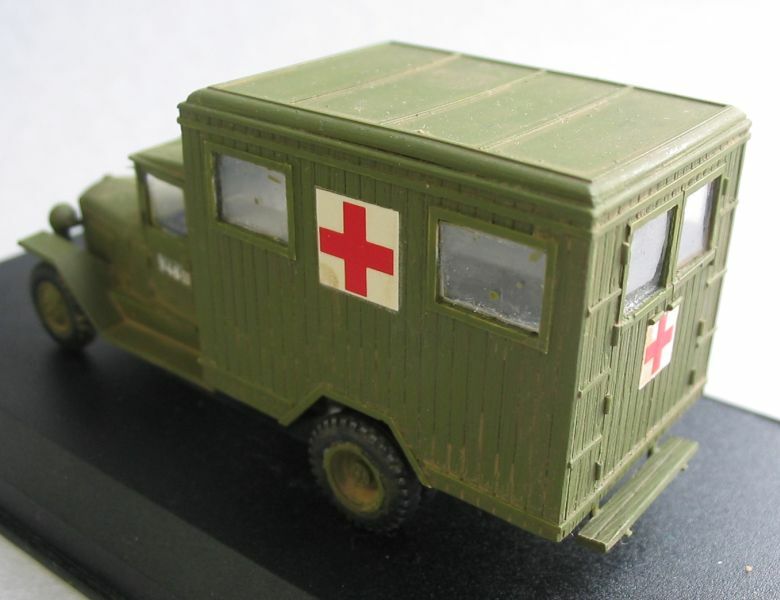 There were ventilators and heating. 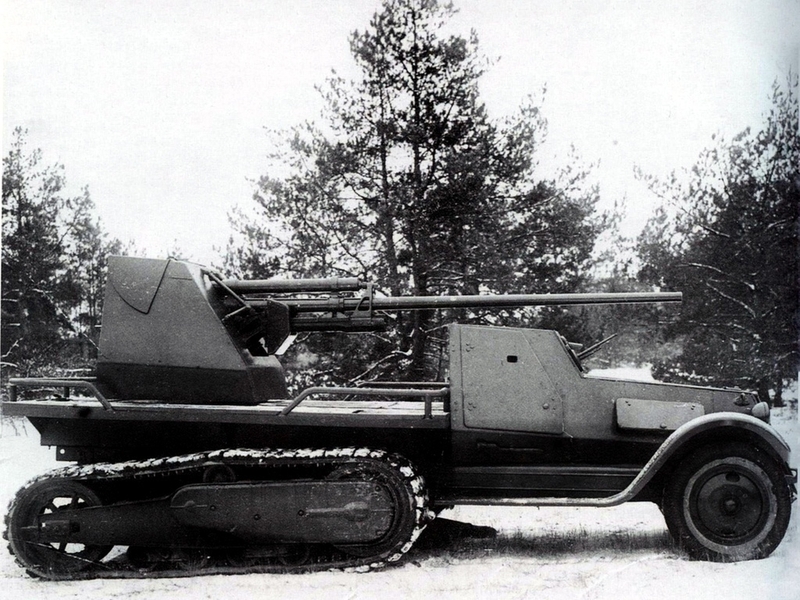 Zis-16S was used in period of WWII on the battle field. 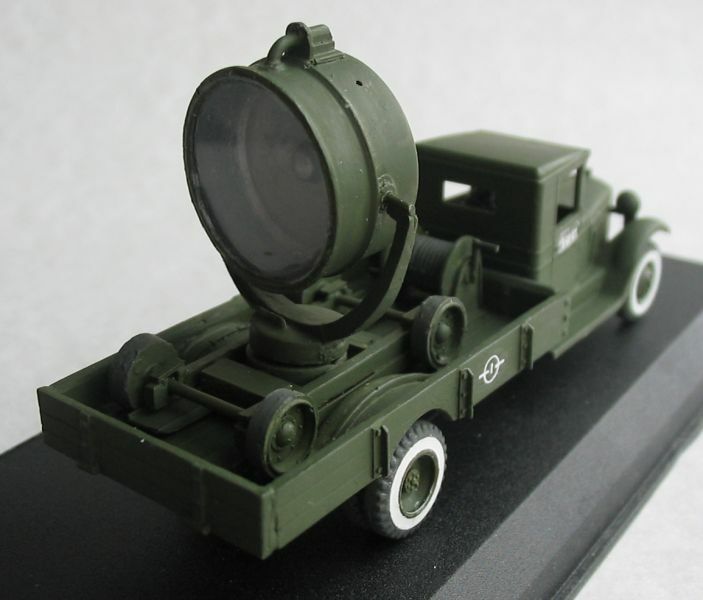 During the war in the Red-Army was widely adopted an active anti-aircraft searchlights on the base of Zis-12. 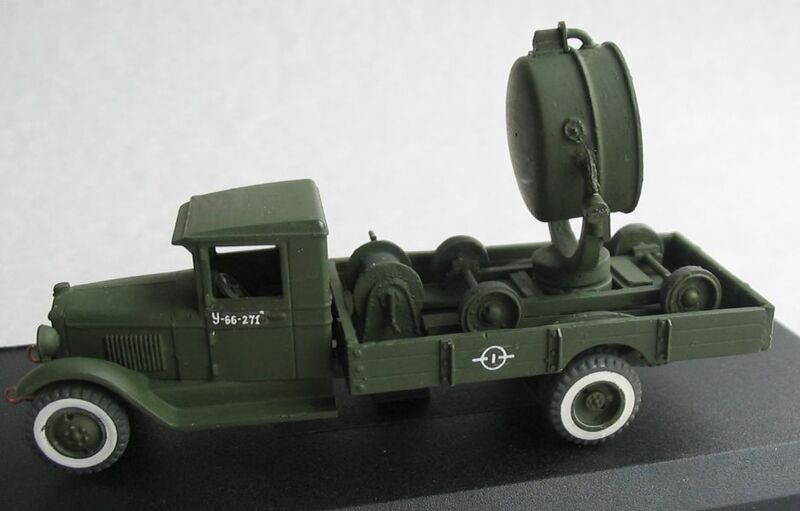 Searchlights realized search and blinding of enemy's aeroplanes and was adopted for lighting of ground arms. 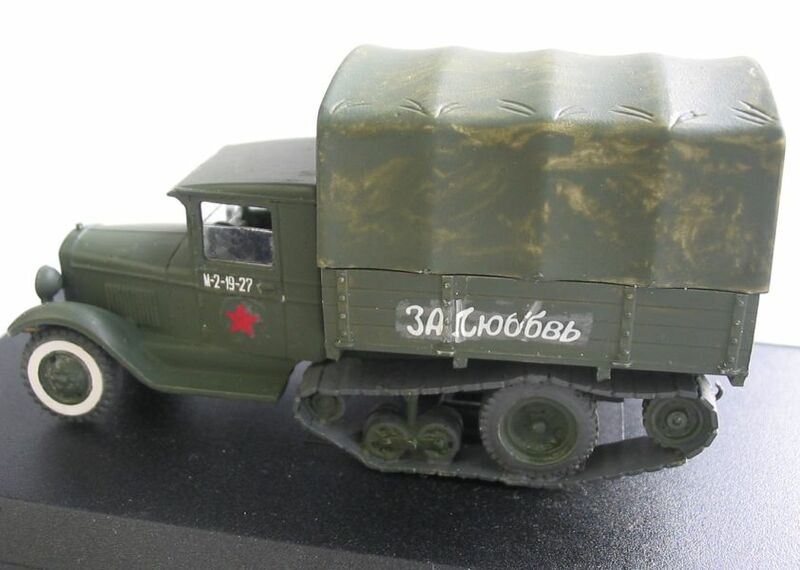 So they acted under Moscow and Tula in autumn 1941 and under Stalingrad in summer 1942. 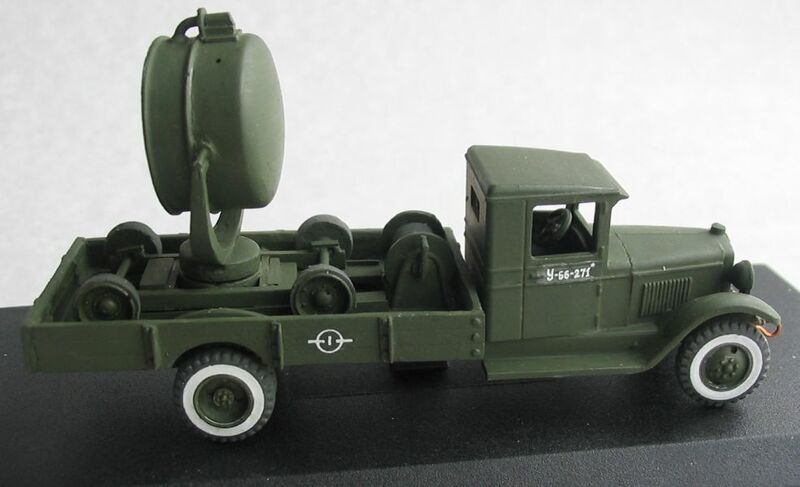 142 anti-aircraft searchlights took past in Berlin operation. 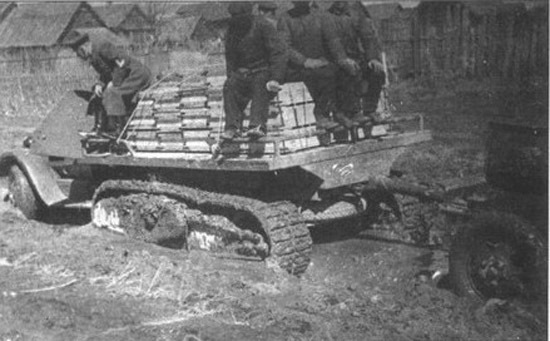 They were included at the same time after preparatory bombardment. 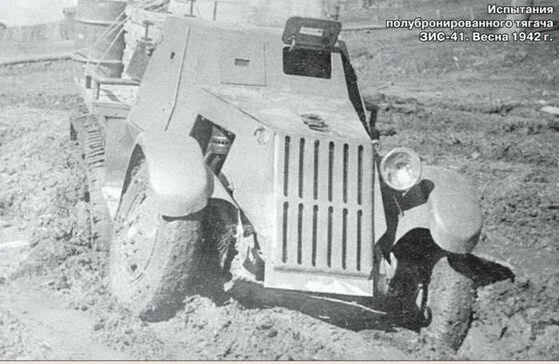 Enemy was blinded and stuned by the light of 14 millions candles. 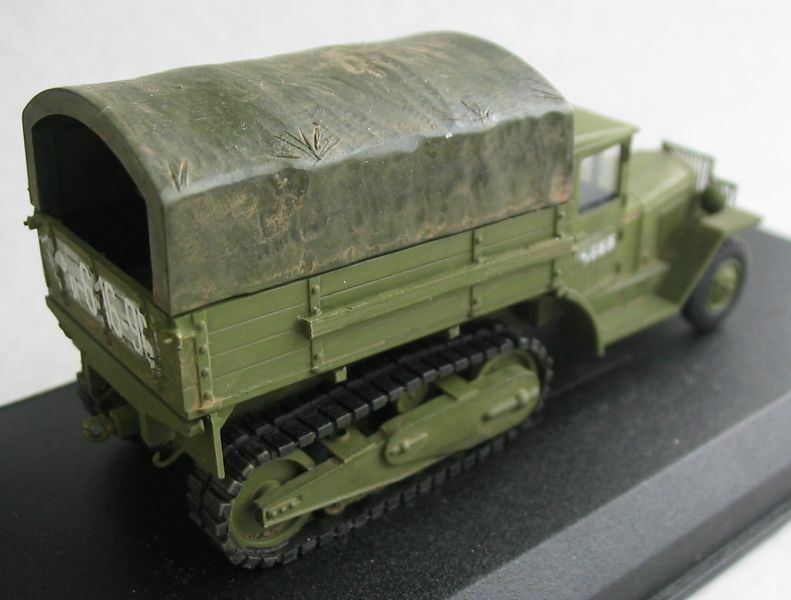 Zis-43 - Armoured Halftrack with 61-K 37mm AA gun. 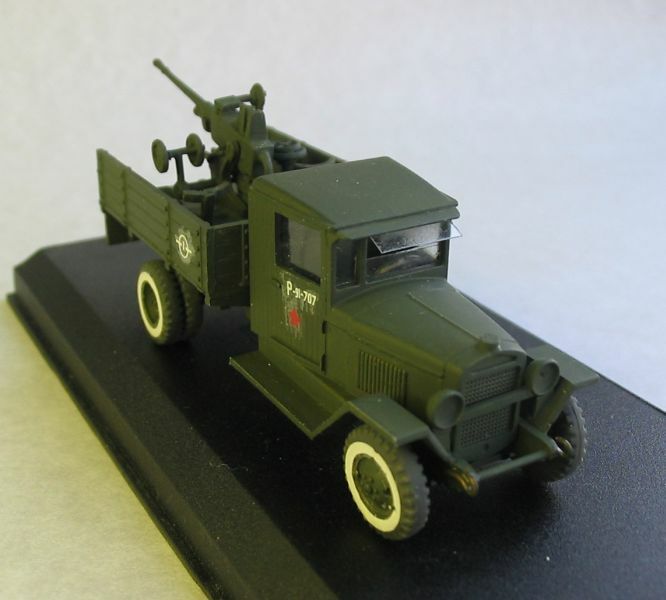 The motor guns had been applied in the Red Army for supporting mechanized units, they represented an automobile with a platform, on which was mounted a pedestal with swinging regimental gun of 76.2mm of 1927 year model, containing panel cover. 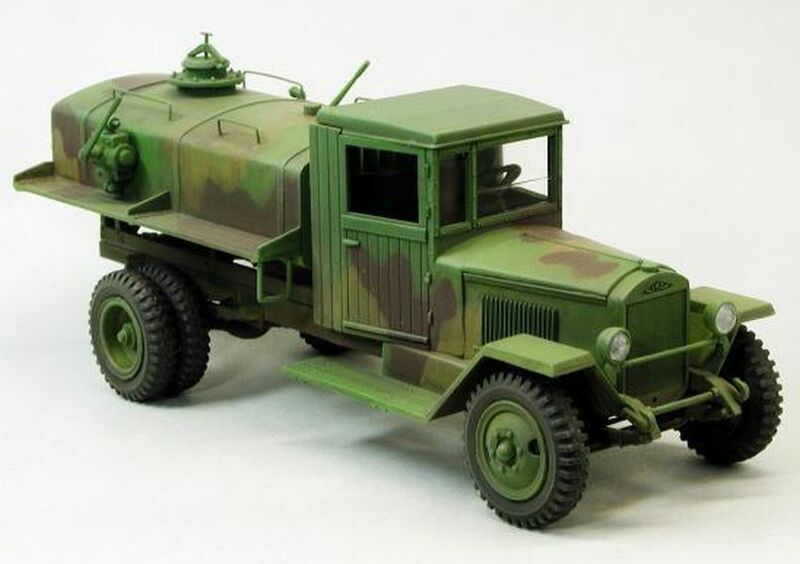 The most known model was motor gun on the basis of the Gaz AAA model, besides that one, was mounted as well an installation on three-wheeled chssis Jag-10. 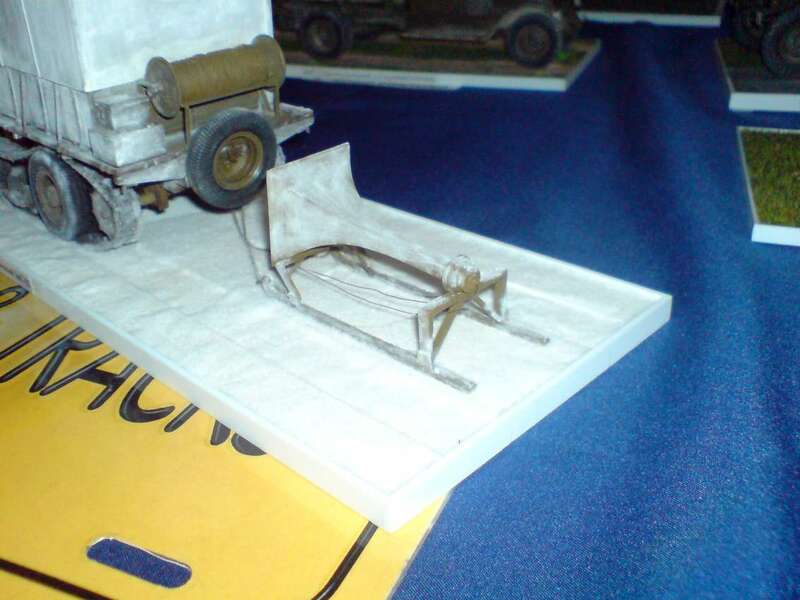 In 1941 this model of gun was released in Leningrad in Kirov factory, mounted on the chassis of Zis-5. 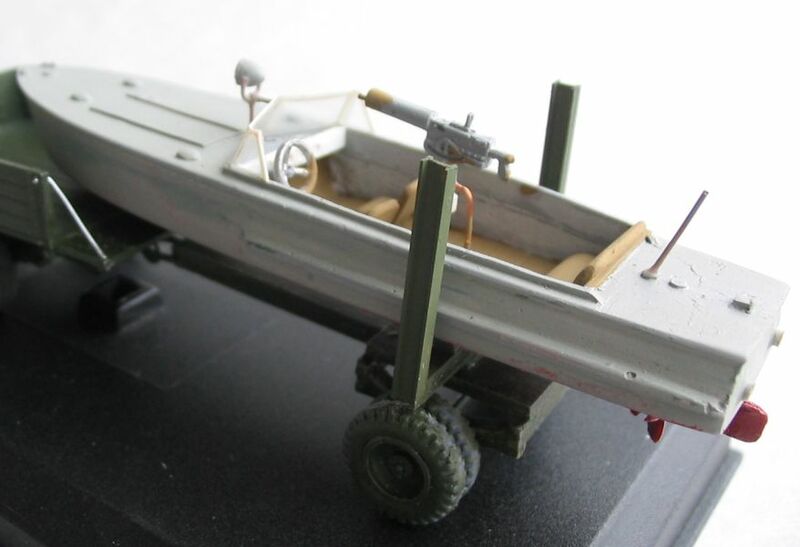 The speed boat releasing has been established long before the war beginning. 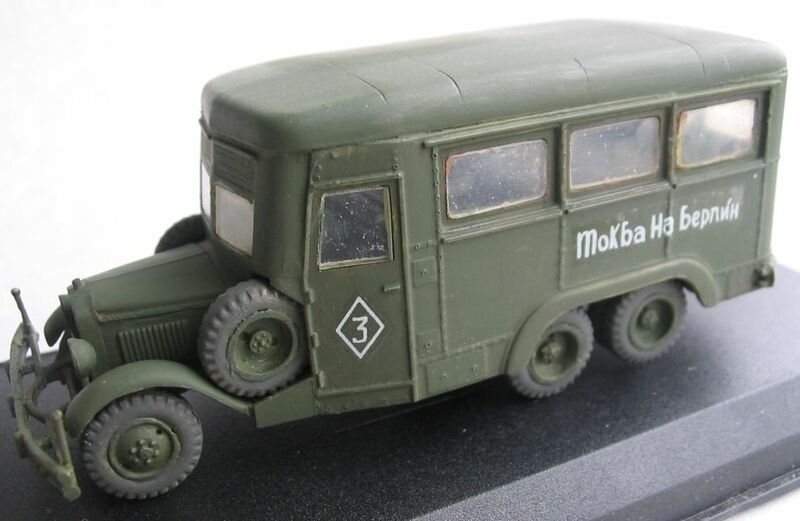 By beginning of the war the speed boats had been mobilized and included in Voljsk's Military Flotilia composition. 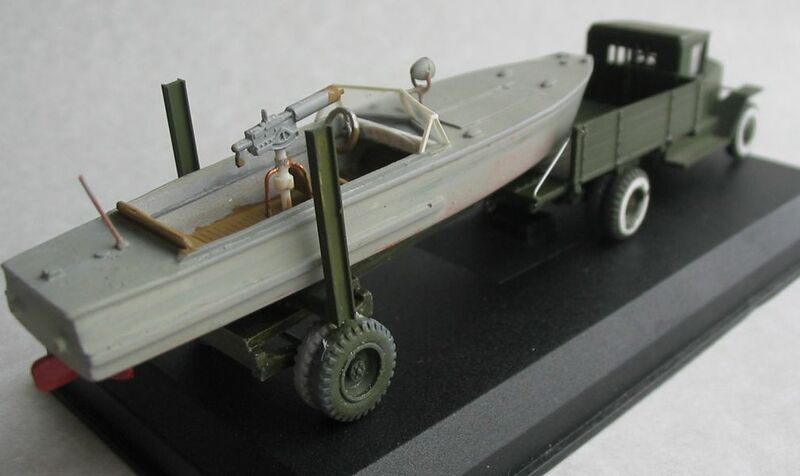 The fighting experience showd extraordinary value of the boats in discussion while military operations on the rivers. 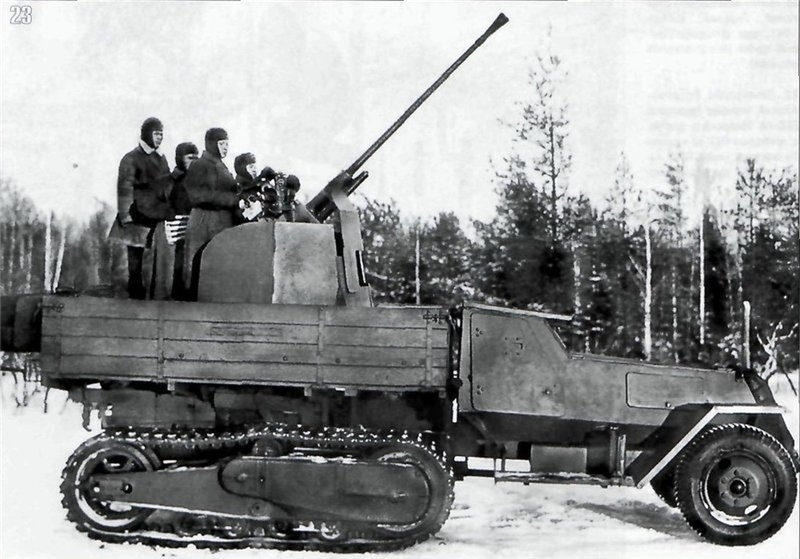 Being armed with so-called "Maxim" guns, they had been used during reconnaissance, landing of diversionary groups in the enemy's rear, as well for pontoons towing with heavy armaments. 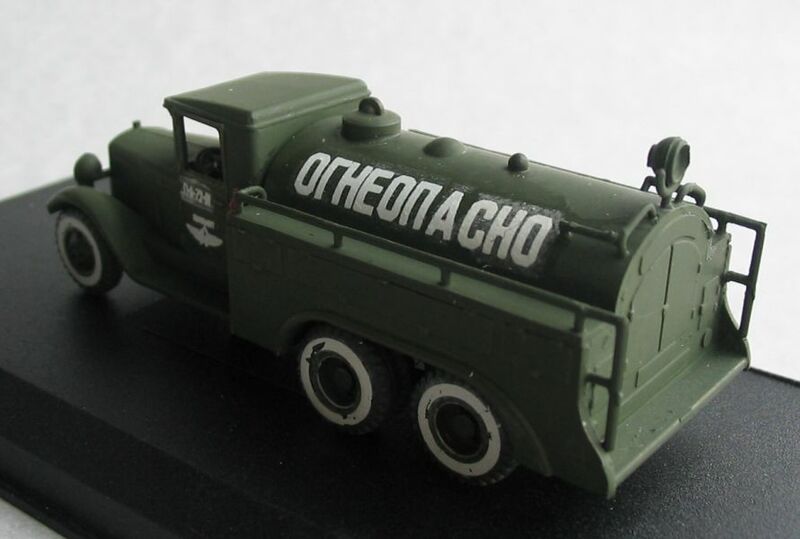 They also fighted on the rivers Dnepr, Pripeati, Visla and Odera. 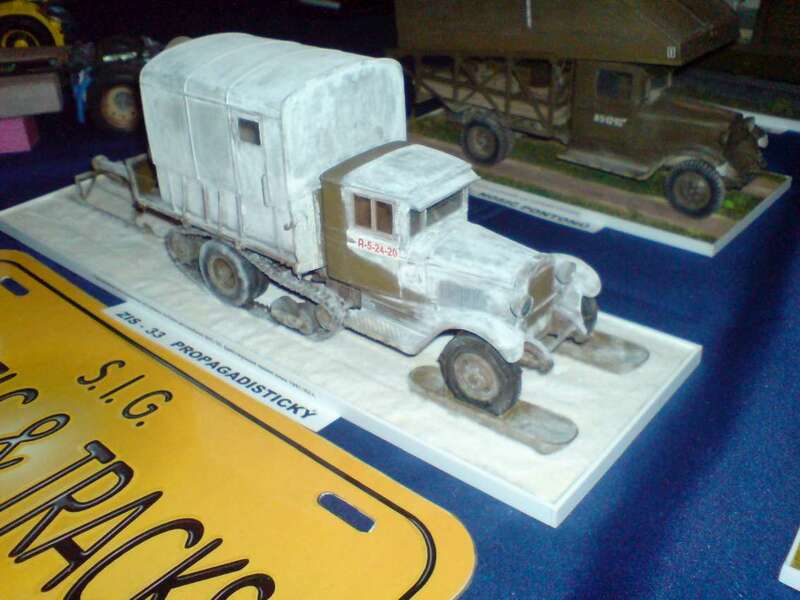 During several days of shuttle flight on Shpree river in Berlin, there were transported many soldiers, guns, mortars and tanks. 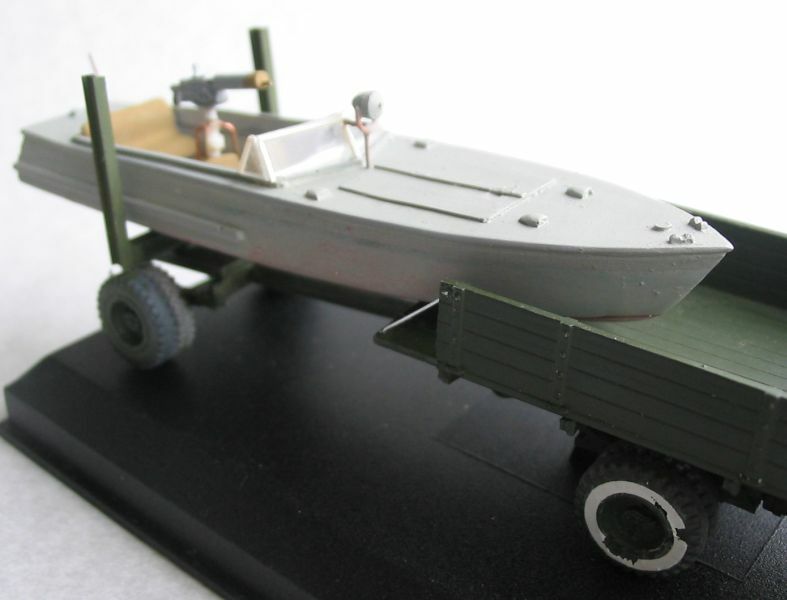 The PG-117 speedboat was constructed based on the Russian NKL-27 tourist cutter of Soviet designer D.T. 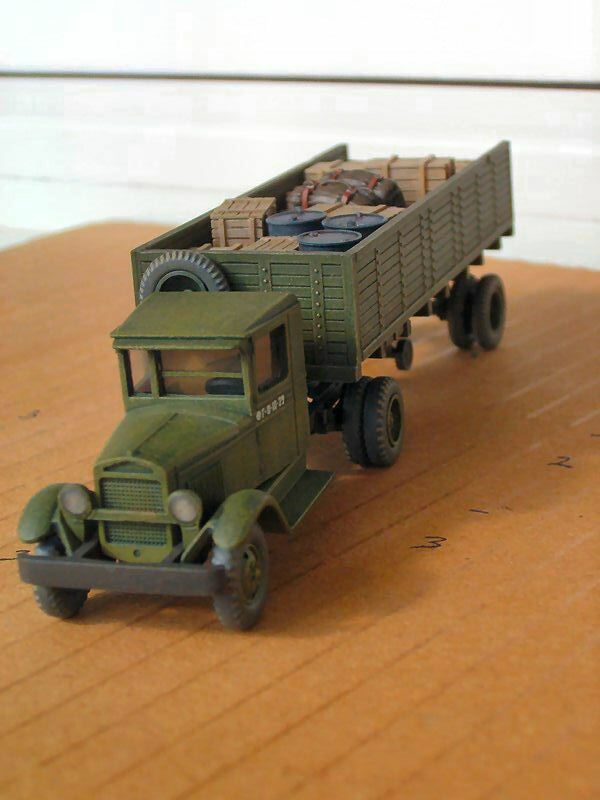 Karpov. 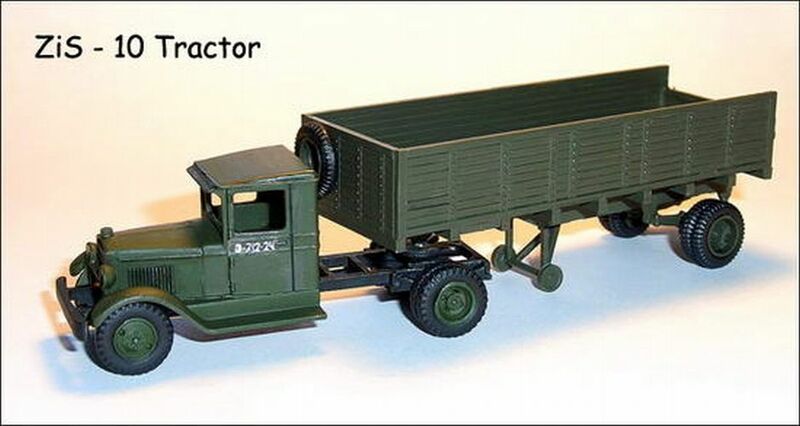 Pictures from internet - owner unknown. 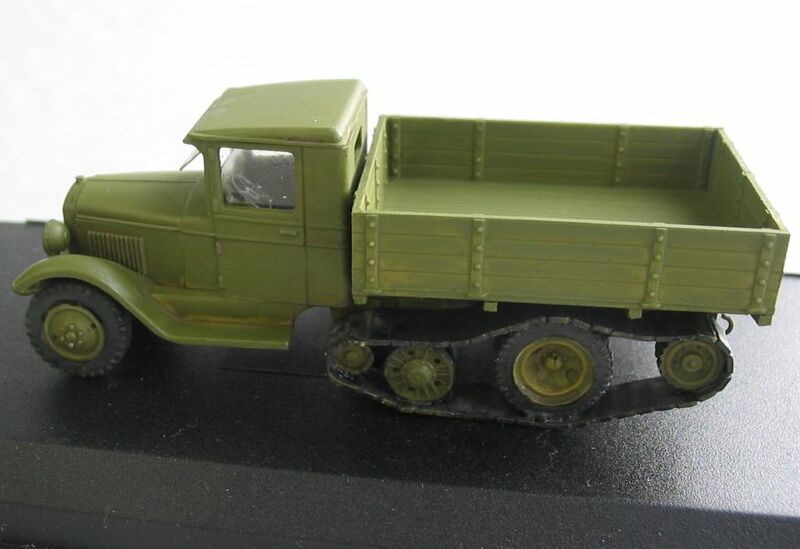 Interested in more and others Zis-truck varianten?? 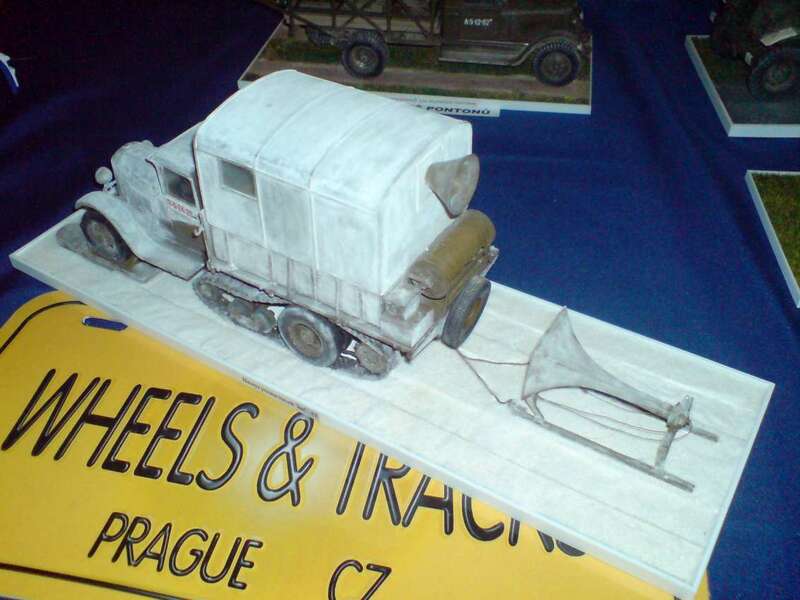 "Zis-o-Mania" Thomas Heinicke from Germany shows the Zis-trucks he has built. 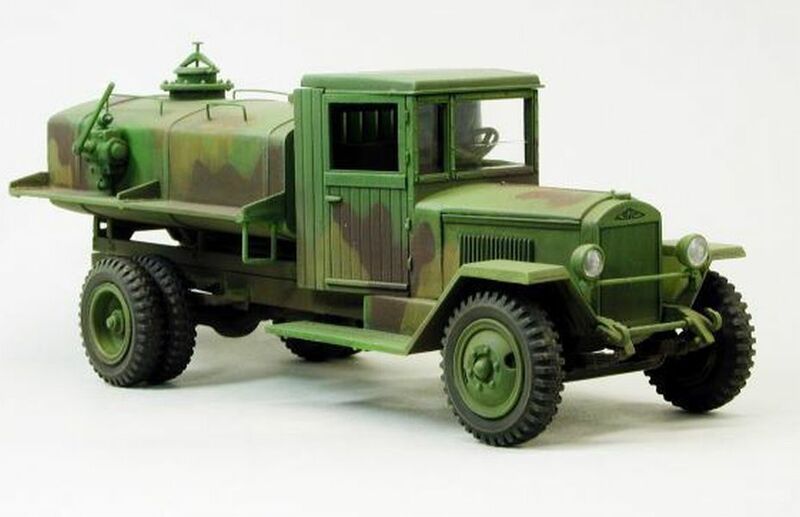 The legendary "polutorka"Gaz-AA was the most widely stread type of the truck in pre-war USSR. 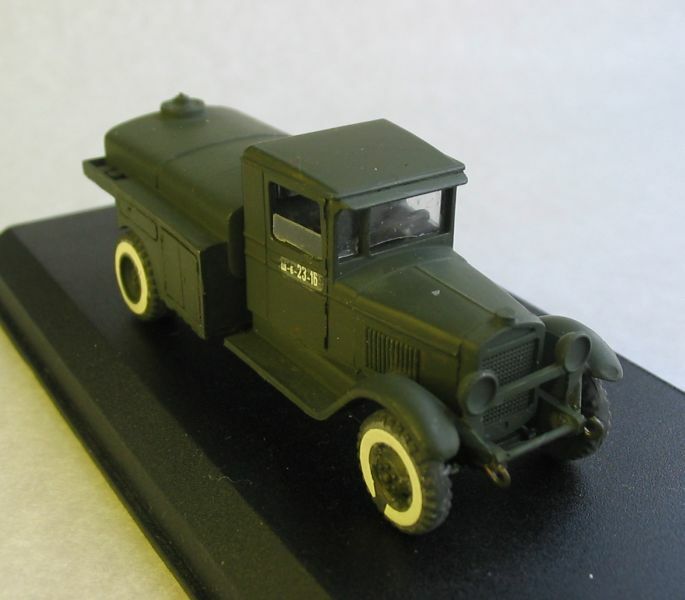 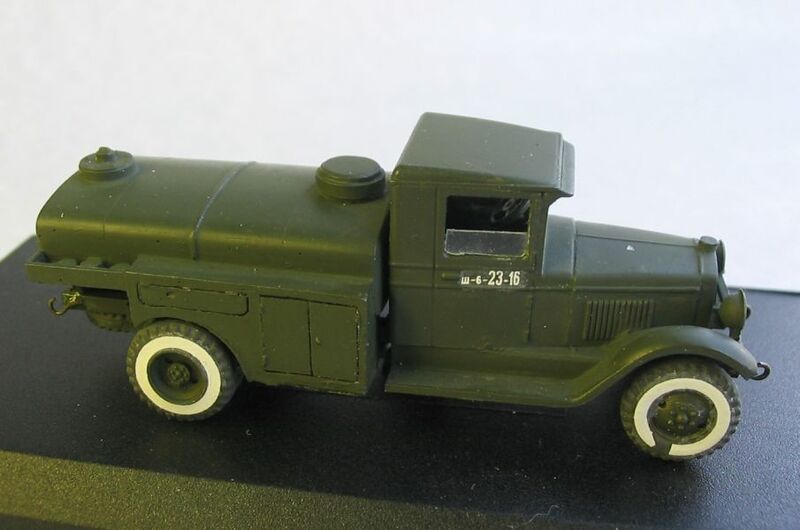 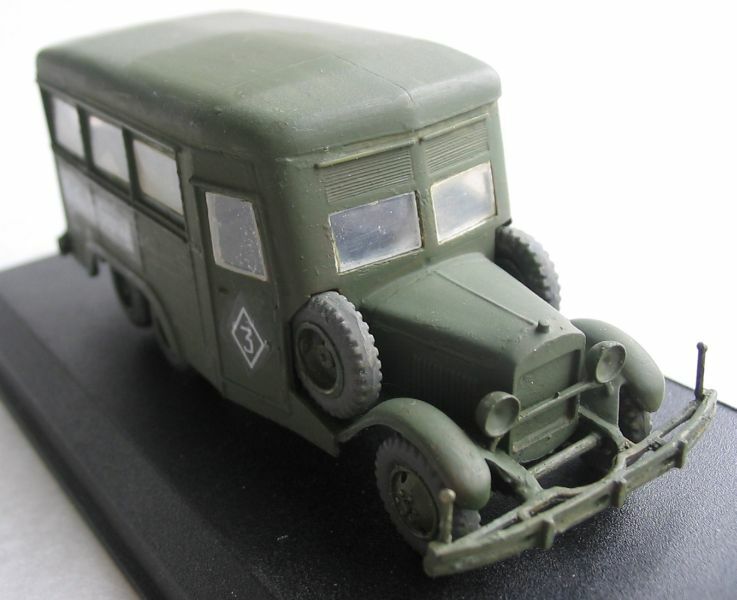 This licensed copy of Ford-AA mod.1929 was produced by factories GAS in Nizhini Novgorod and KIM in Moscow and in Rostov-on-Don since 1930 in all increasing quantities, so on June 20,1941 only in Red Army were registered 151.100 cars of this type. 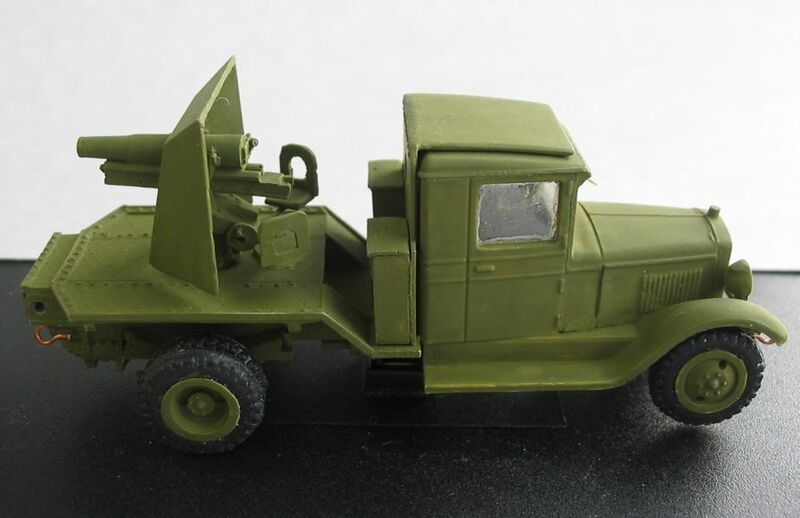 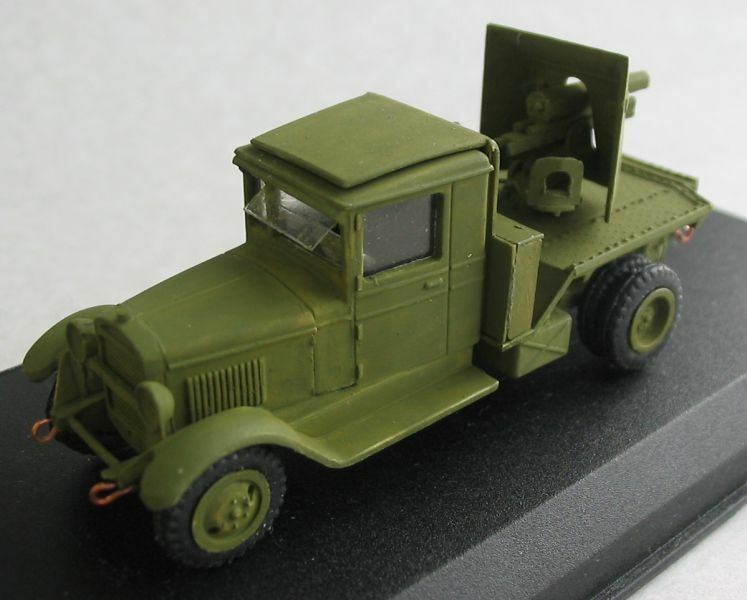 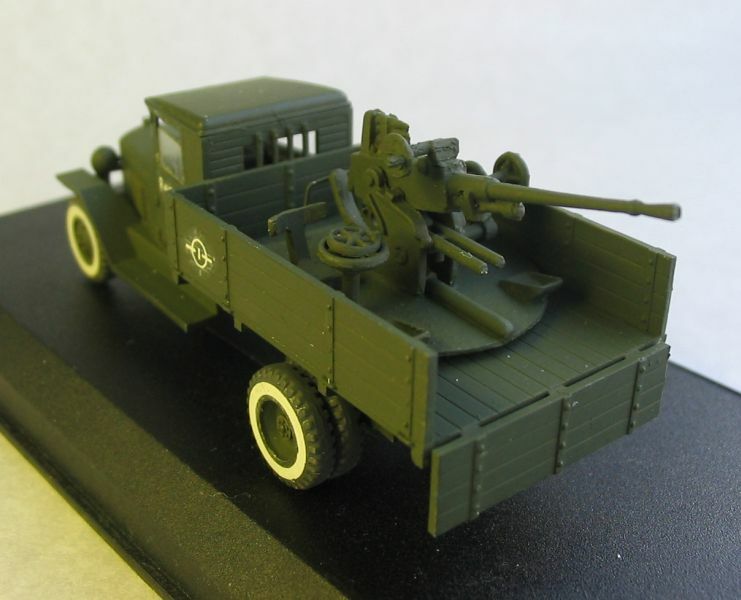 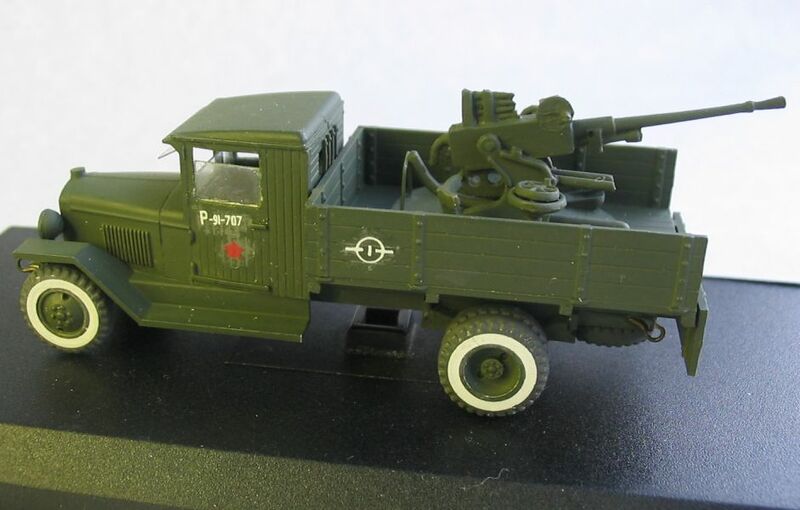 Besides the usual cargo trucks, the cars with antaircraft mounts of 25mm guns and with the quadruple 7.62mm "maxim" machine guns, fuel trucks, mobile radio stations etc. 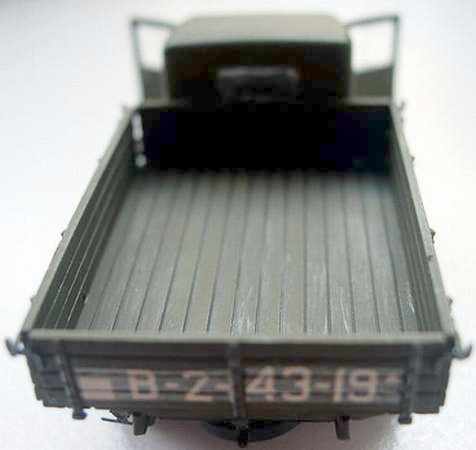 were used in tropps. 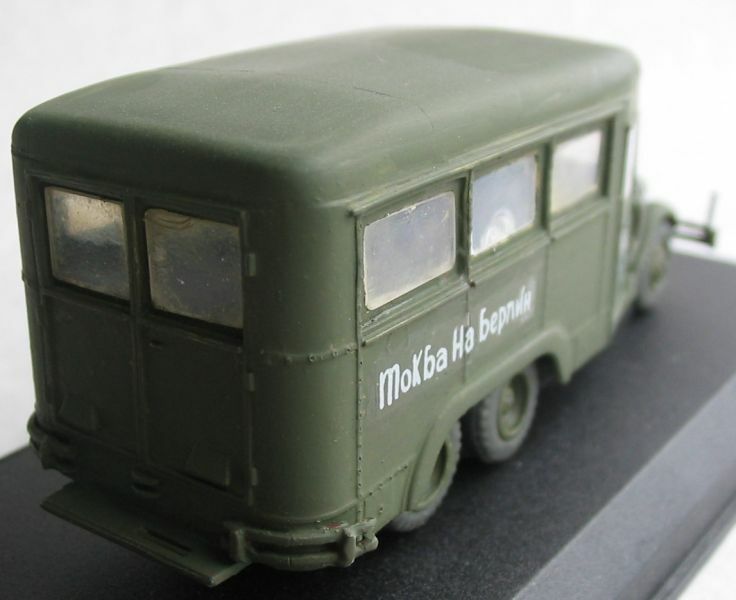 The ambulance Gaz-55 and converted to ambulance 15-seat buses GAZ-03-30 were also widespread. 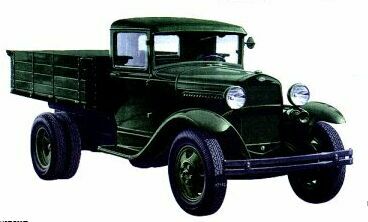 The car manufactured serially till 1950. 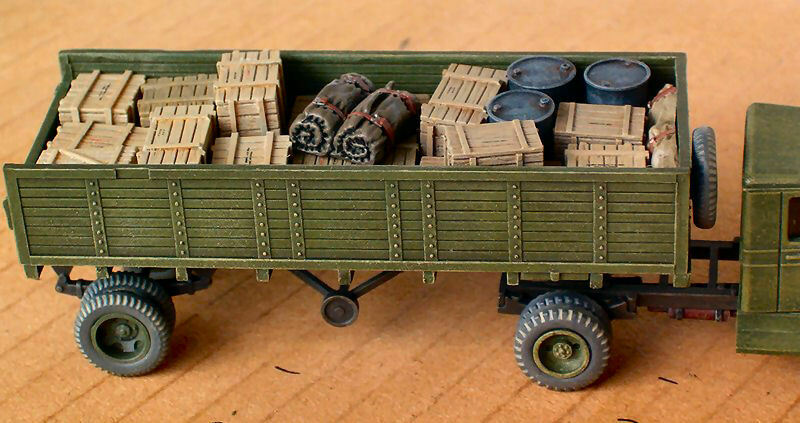 The total production exceeded 1.000.000. exemplars. 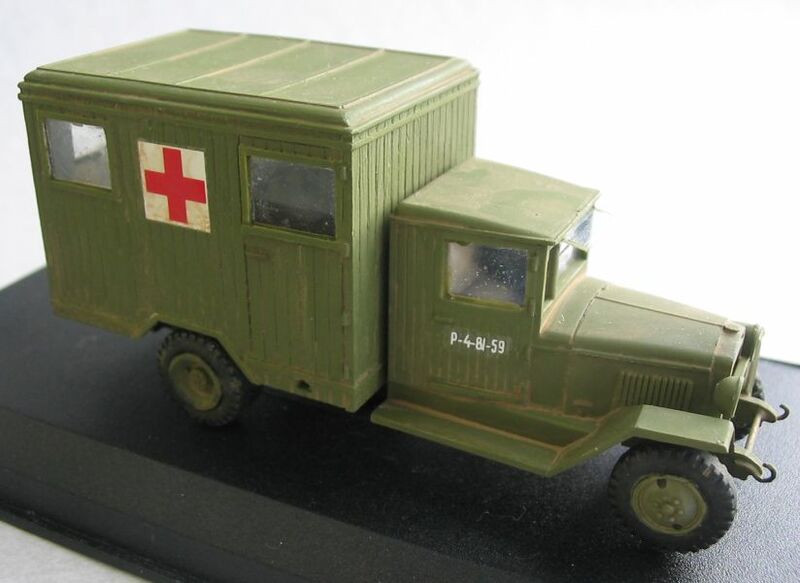 The GAS-AA was unpretentious and cold be operated on any sort of gasoline, when the weather was hot even on kerosene. 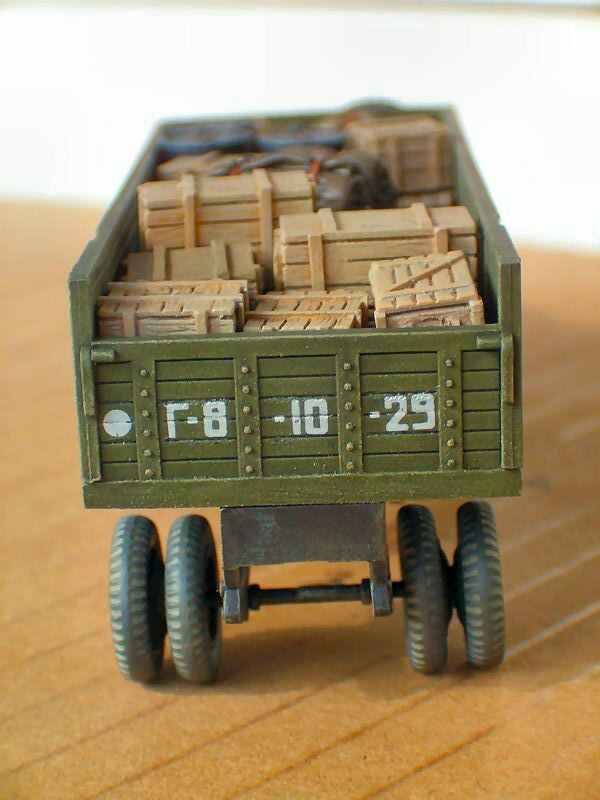 At dead weight of 1750 kg could carry out about 1,5 tons of weight (for that has received its nickname). 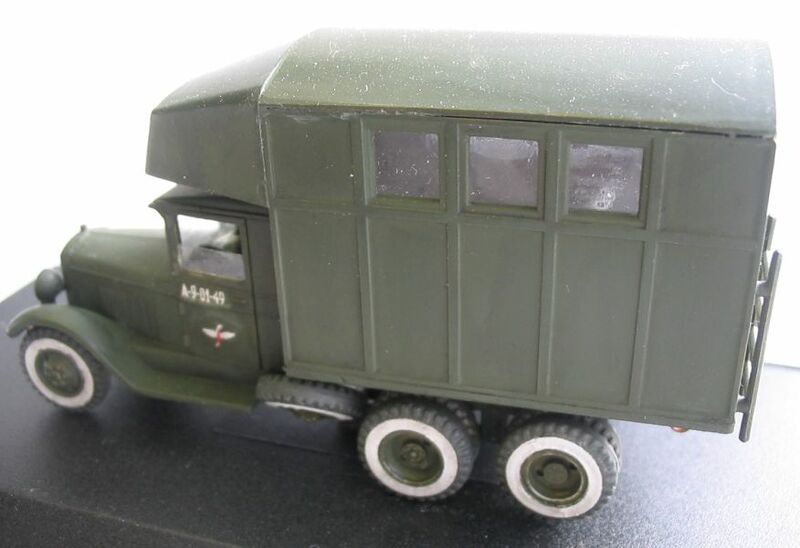 The maximum speed reached 44 mph. 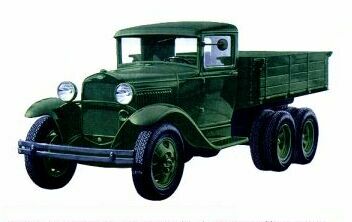 Engine capacity - 40 hp, capacity of the petrol tank - 40 liters. 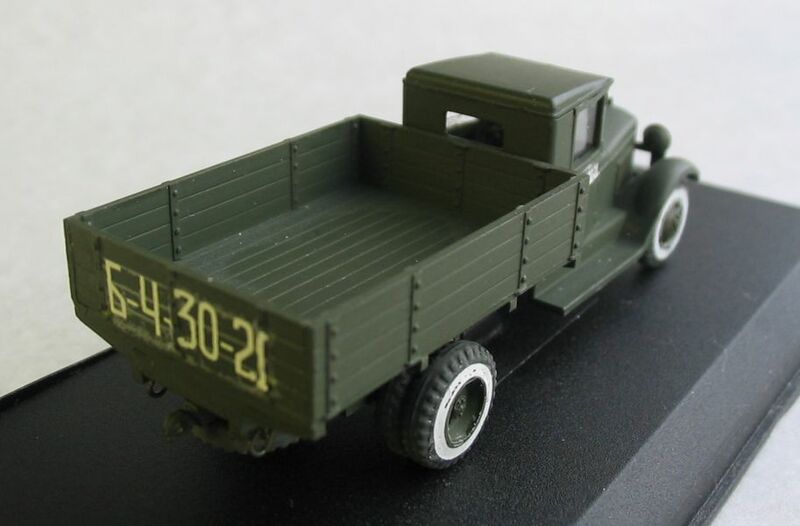 At the end of 1934 the first serial Gaz-AAA trucks has left the assembly line of GAZ factory. 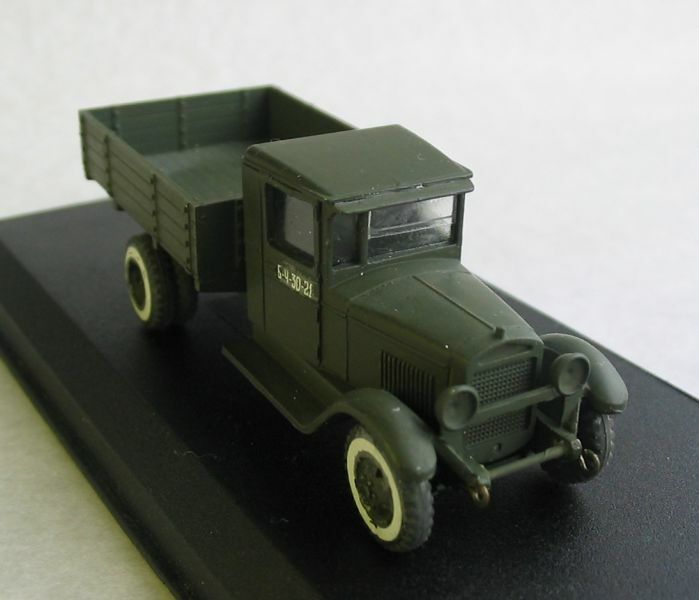 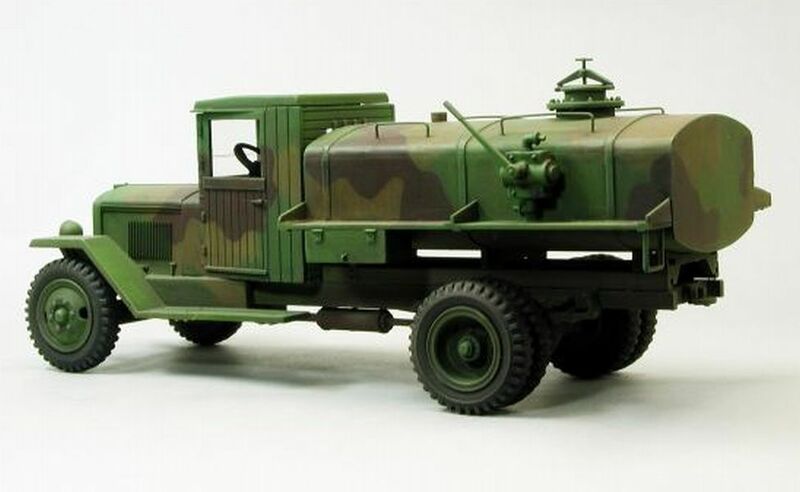 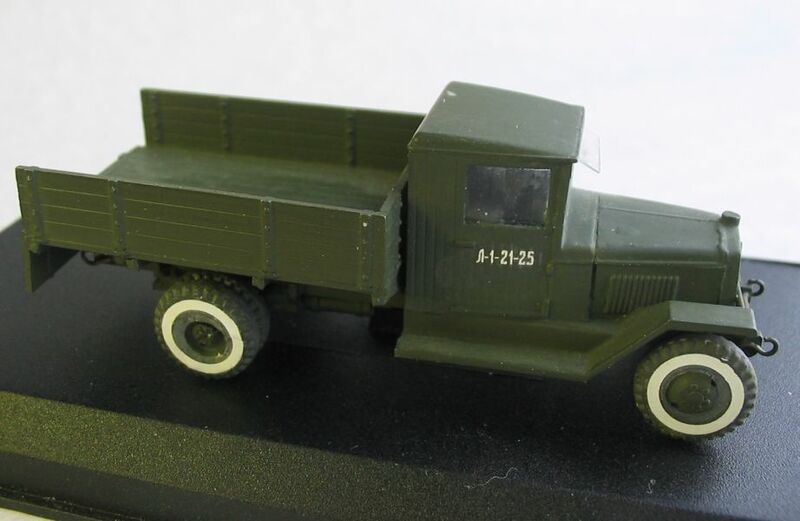 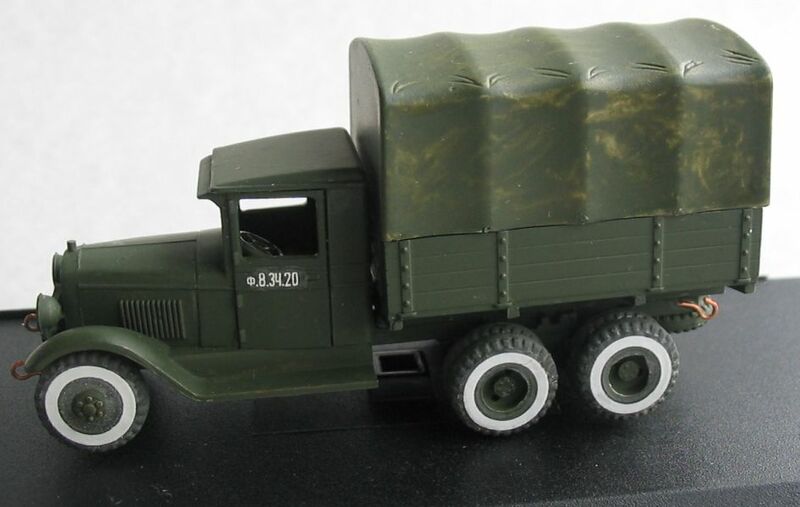 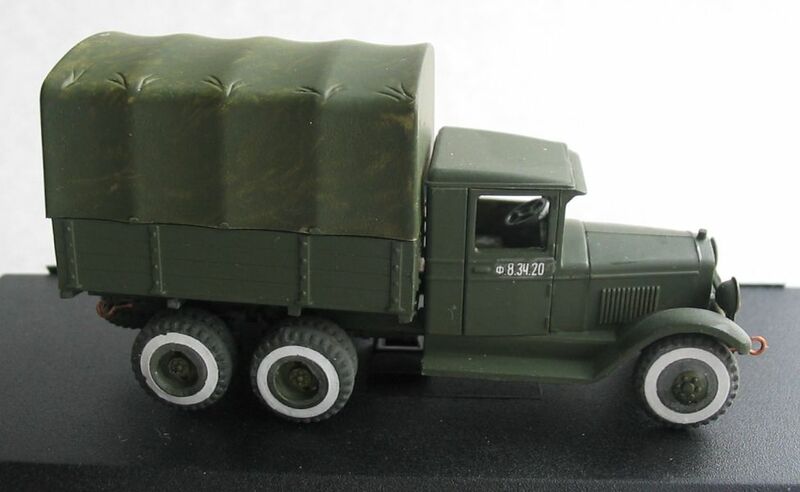 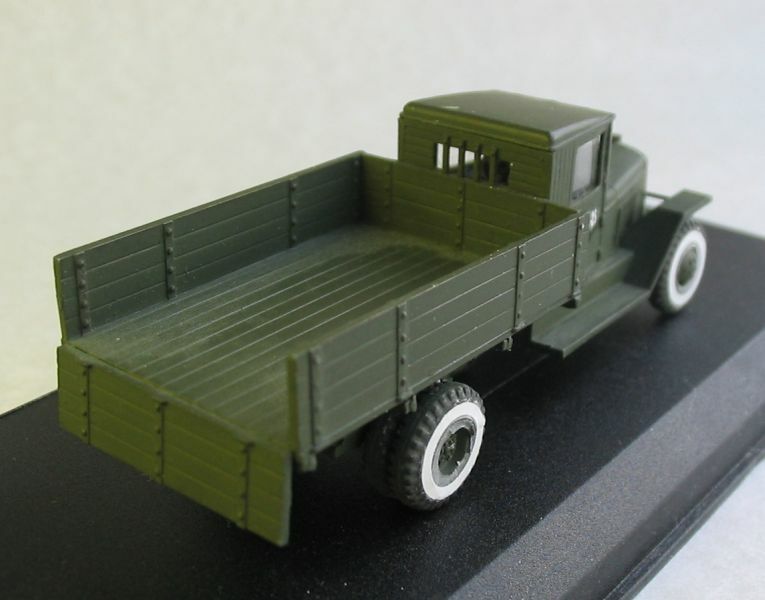 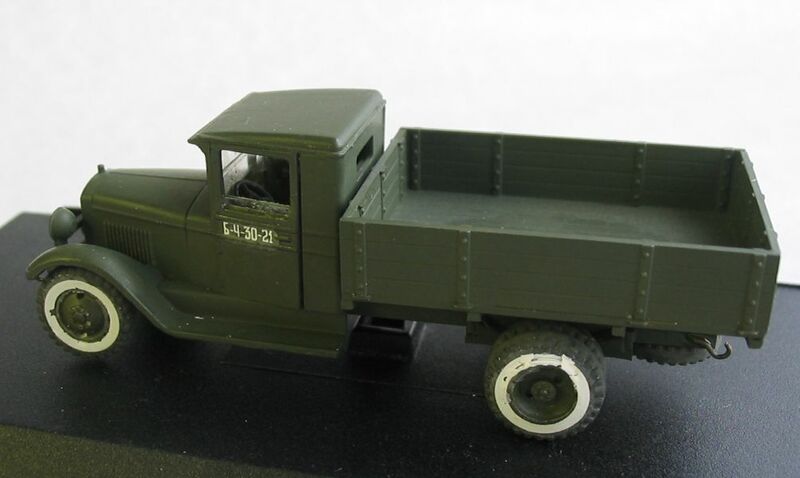 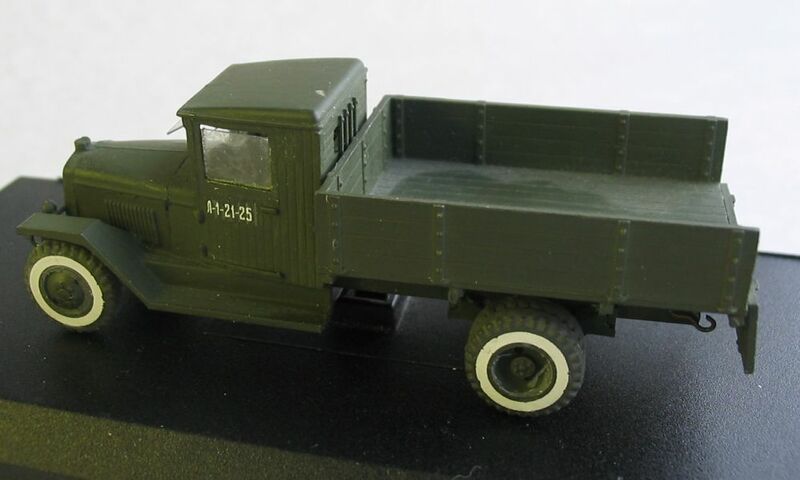 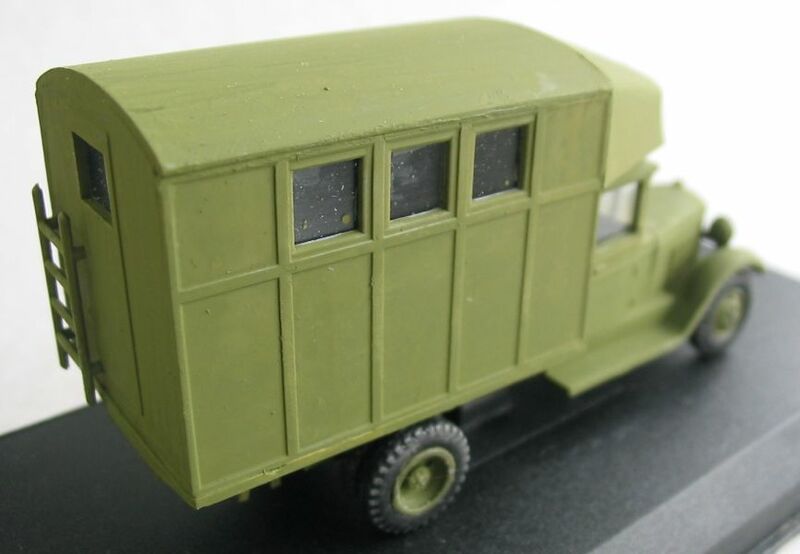 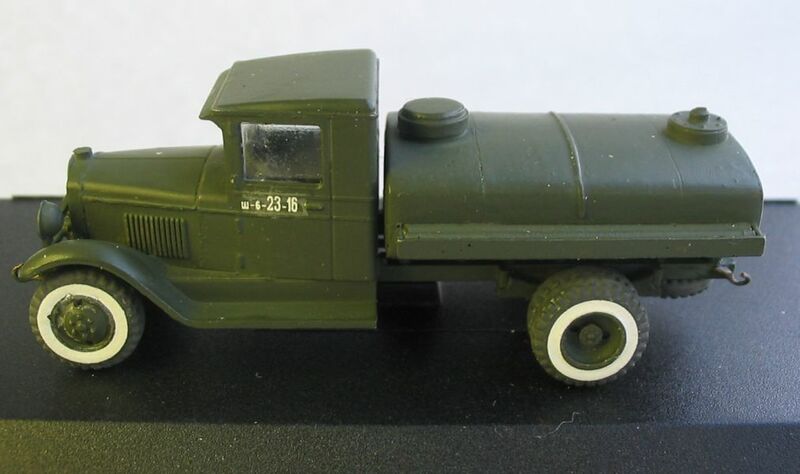 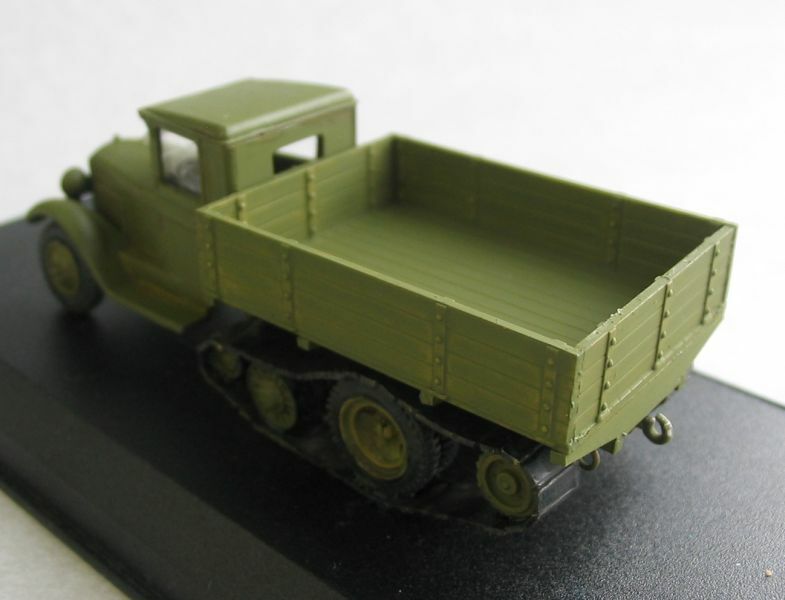 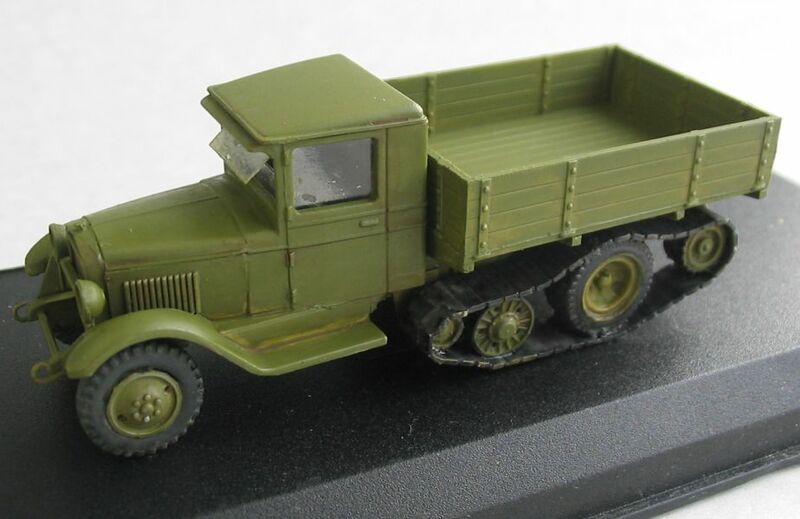 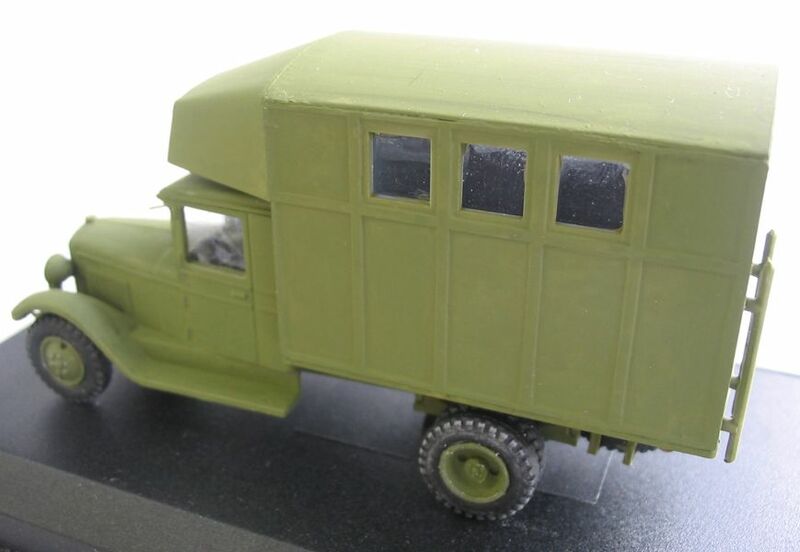 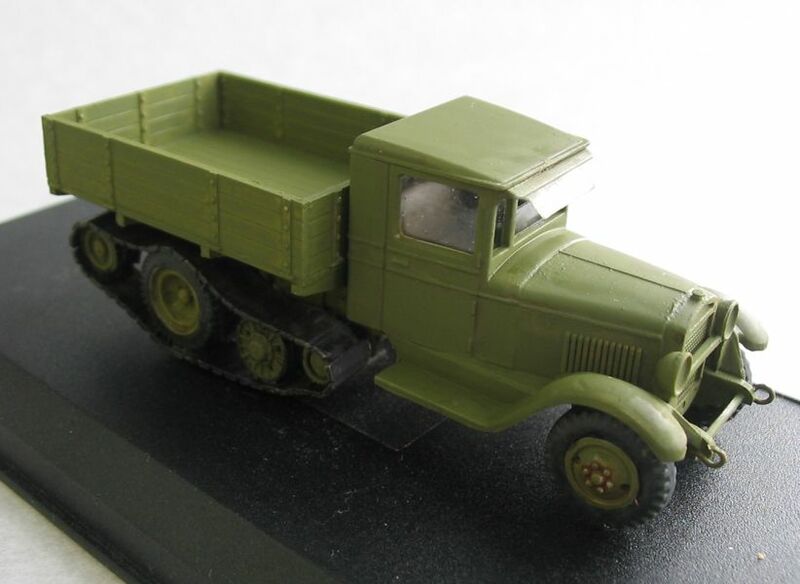 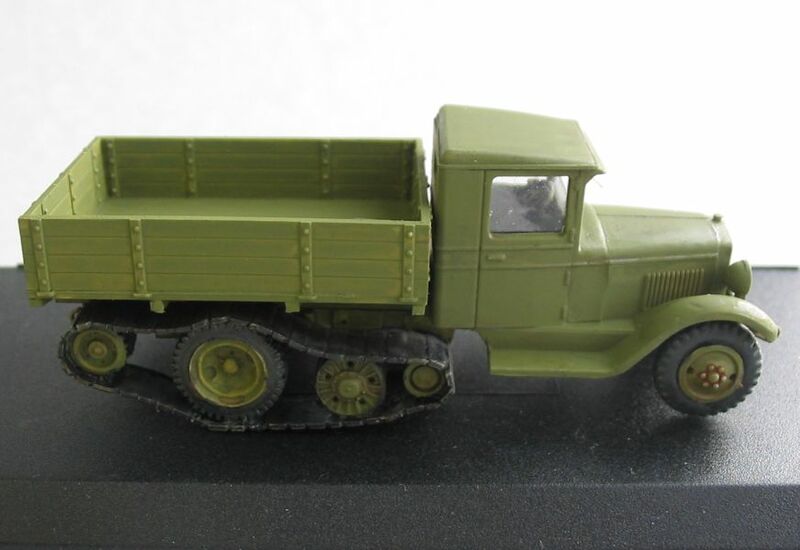 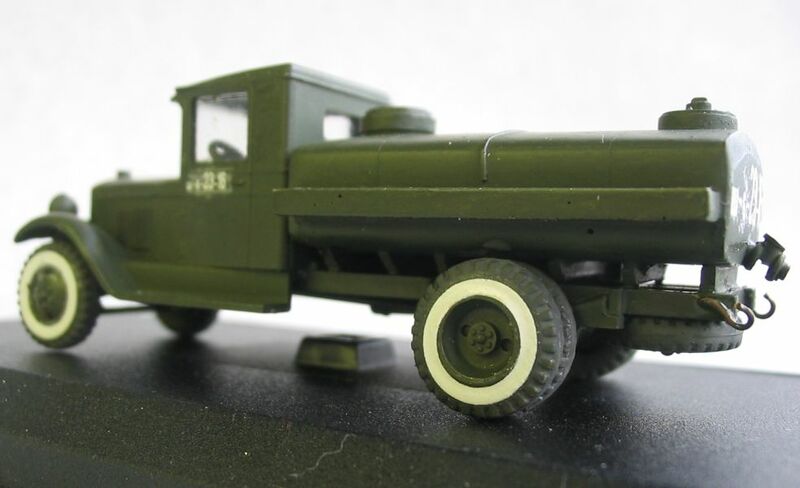 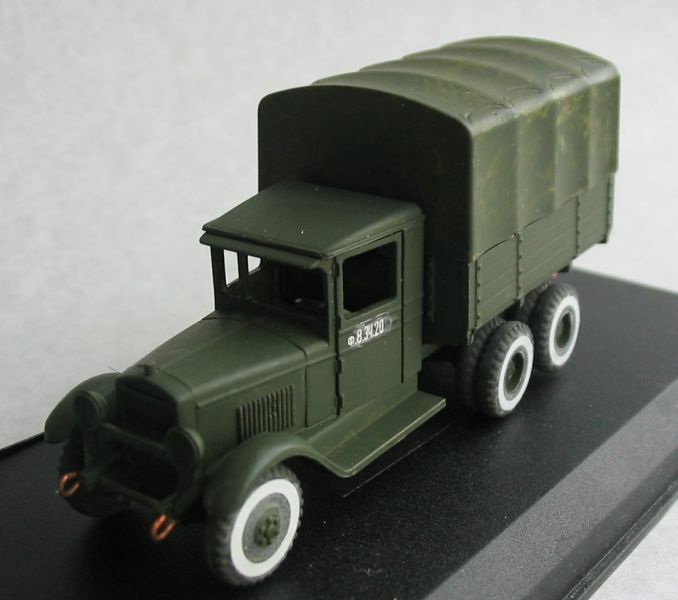 It was the first serial Soviet (6x4) truck. 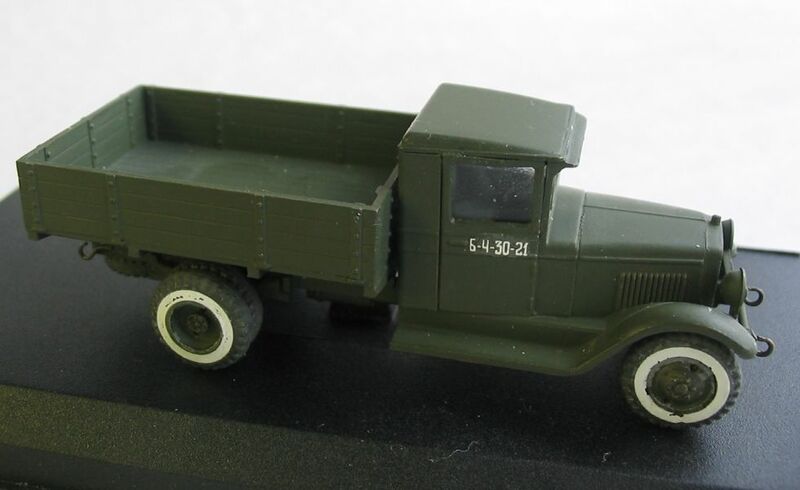 The weight-lifting capacity of the new truck has increased up to 2-tons at the highway (on a ground - 1,5 tons), allowd to archive maximum speed of 40,6 mph. 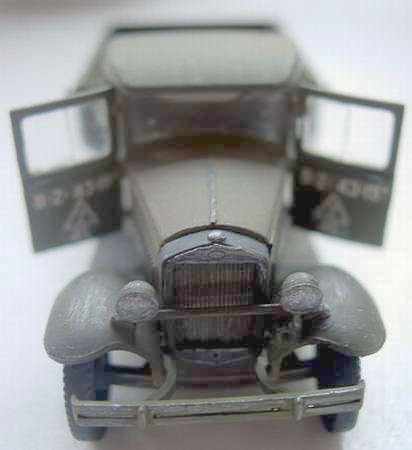 The car became reliable and rather unexpensive. 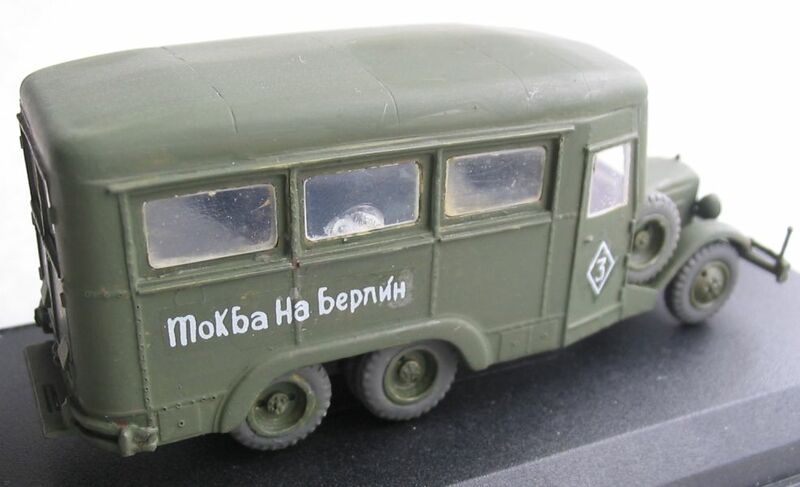 It was used as a base for construction of the bus GAZ-05-193, fuel trucks BZ-38 and BZ-38-U, ground starters AS-2 and AS-3, field repair workshops PM-3 ("letuchka"of an A-type), radar station RUS-2 etc. 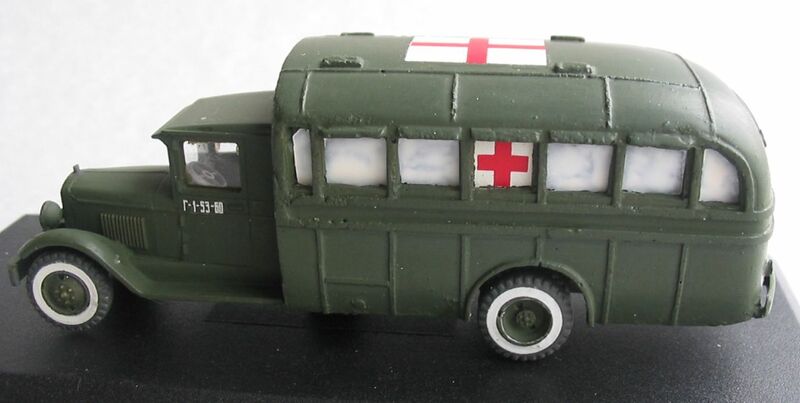 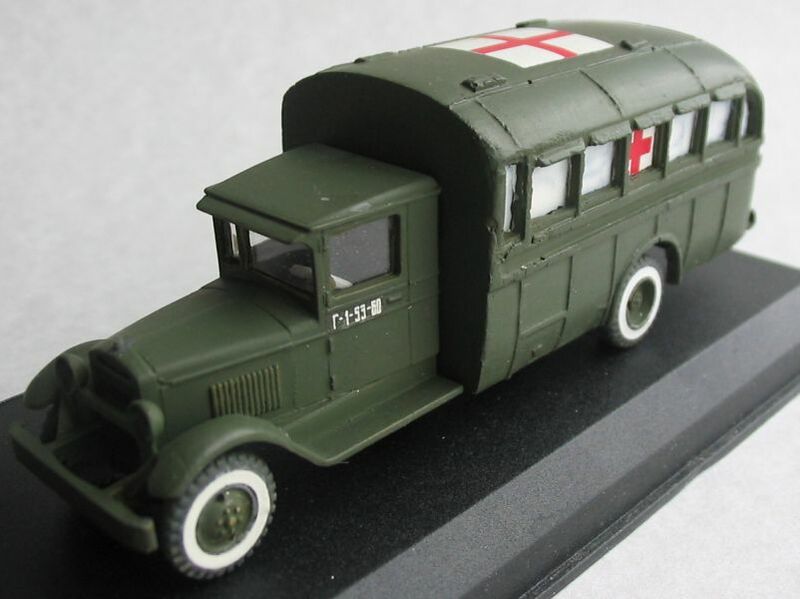 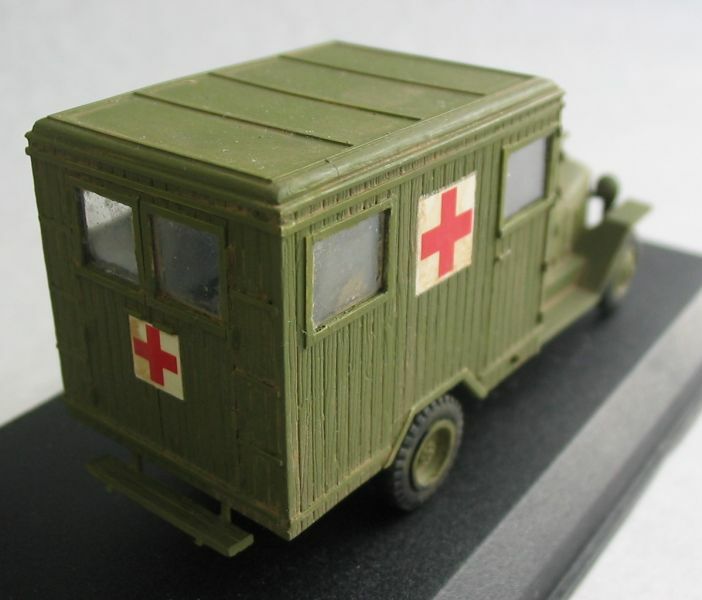 With the beginning of WWII the bus GAZ-05-193 was used as a staff one and a ambulance. 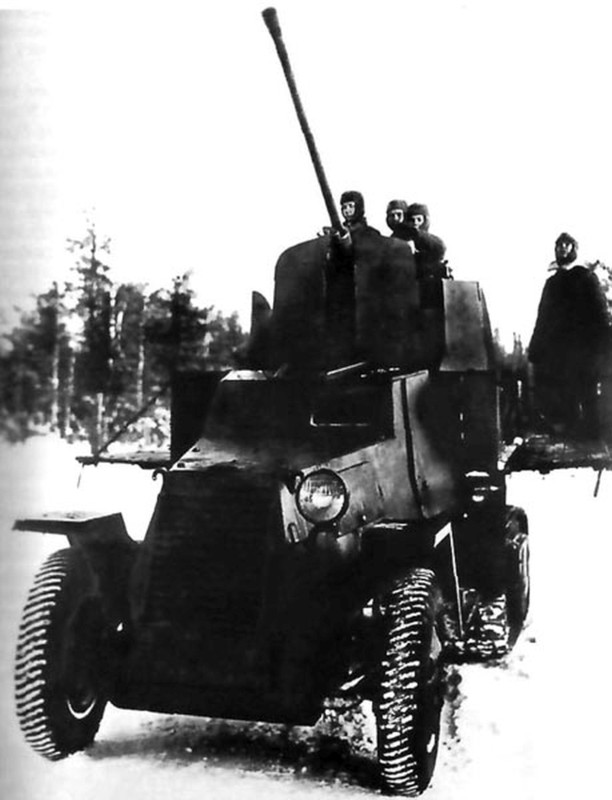 The self-propelled 76mm field guns (SU-12) and 37mm anti-aircraft guns were produced on the base of the GAZ-AAA, it also carried 4M quadruple machine gun mount. 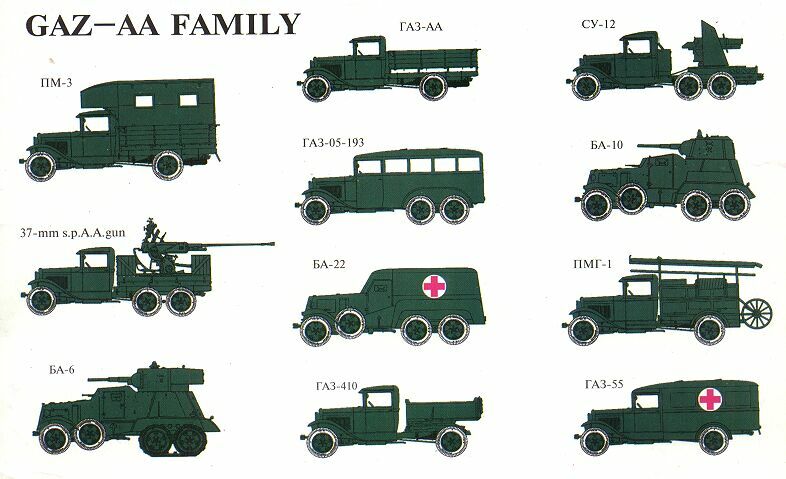 The GAZ-AAA has formed the basis for creation of the whole set of armour cars: gun equipped BA-3, 6, 10; machine-gun equipped BA-9, 30; floating PB-4, 7; ambulance BA-22. 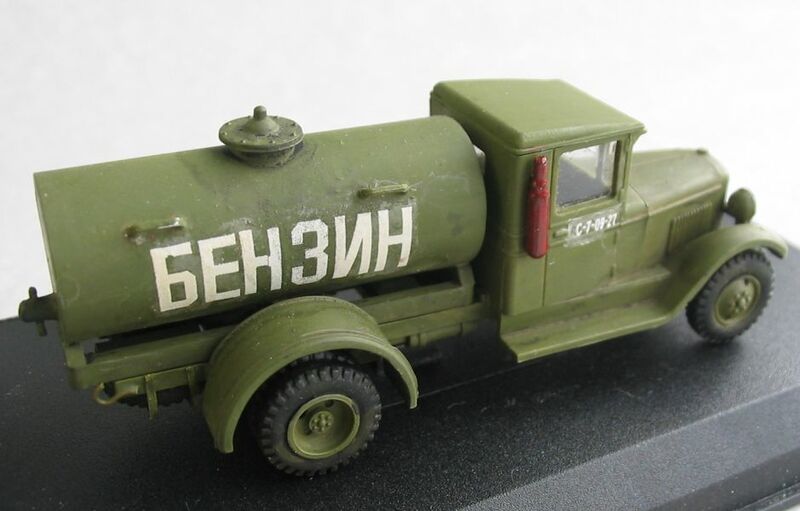 The serial production of GAZ-AAA was ceased in 1943, the total production reached 37.373 exemplars. 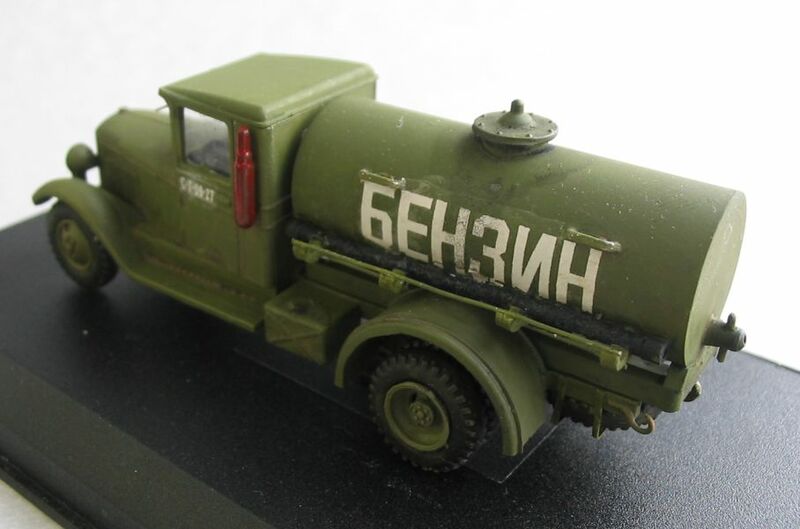 The next pictures are from "Russian Scale Models" and have copyright. 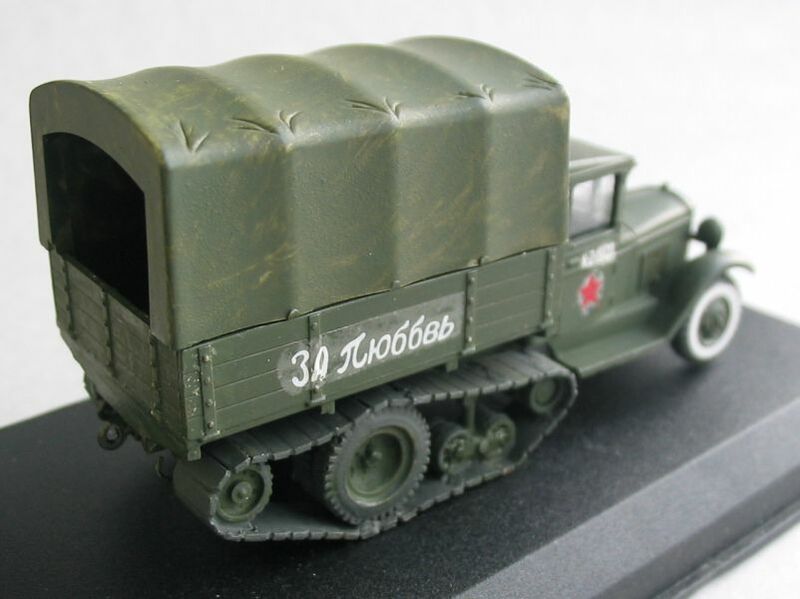 The pictures are showed with permission from the webmaster Alexander Antonov. 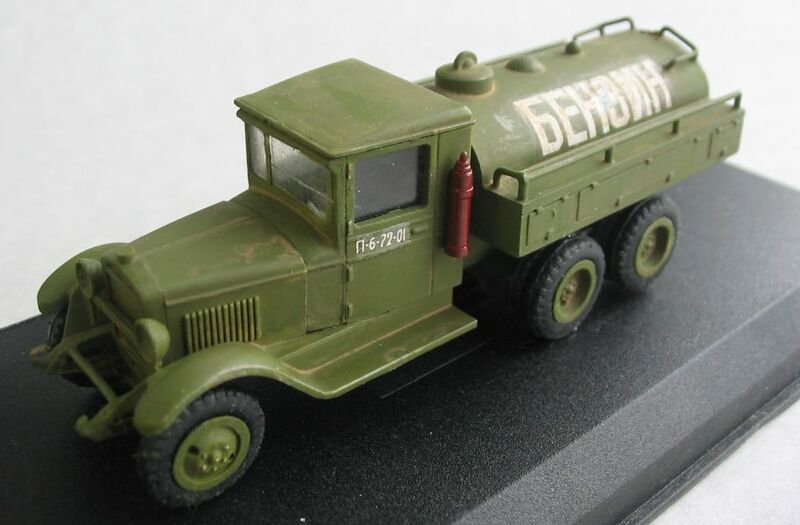 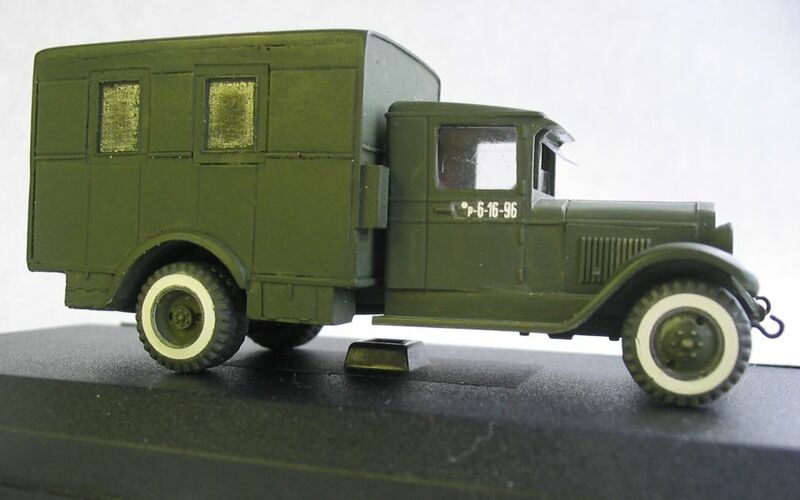 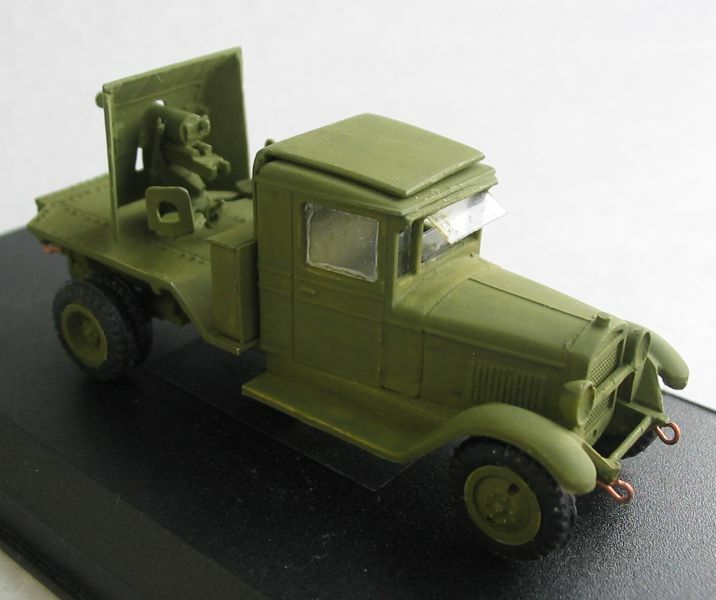 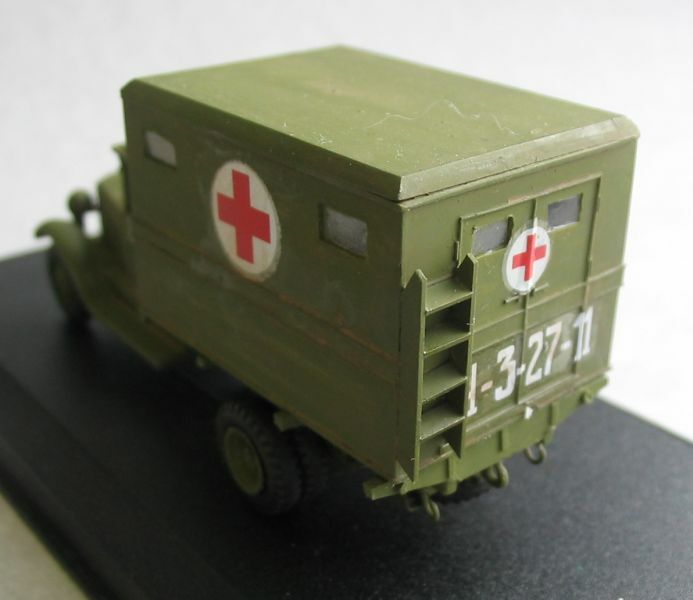 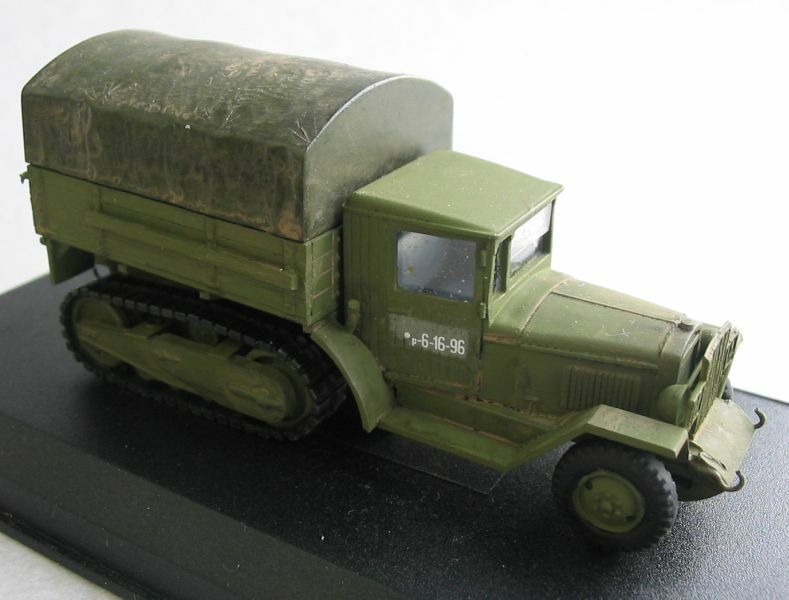 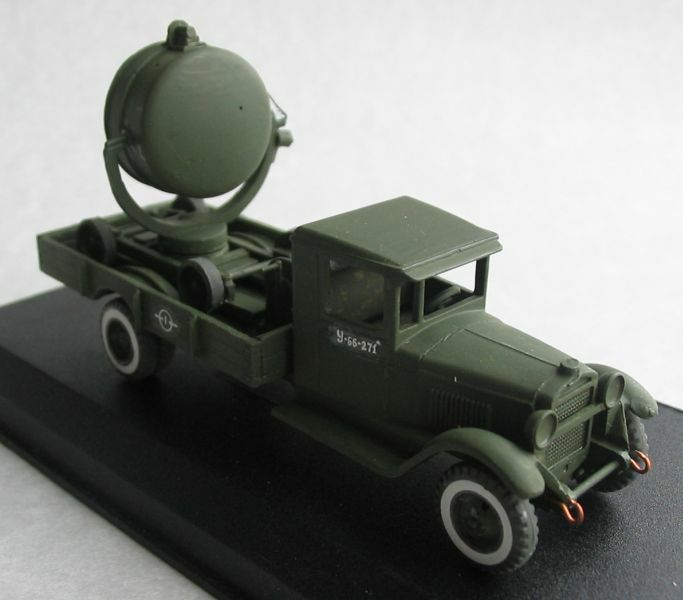 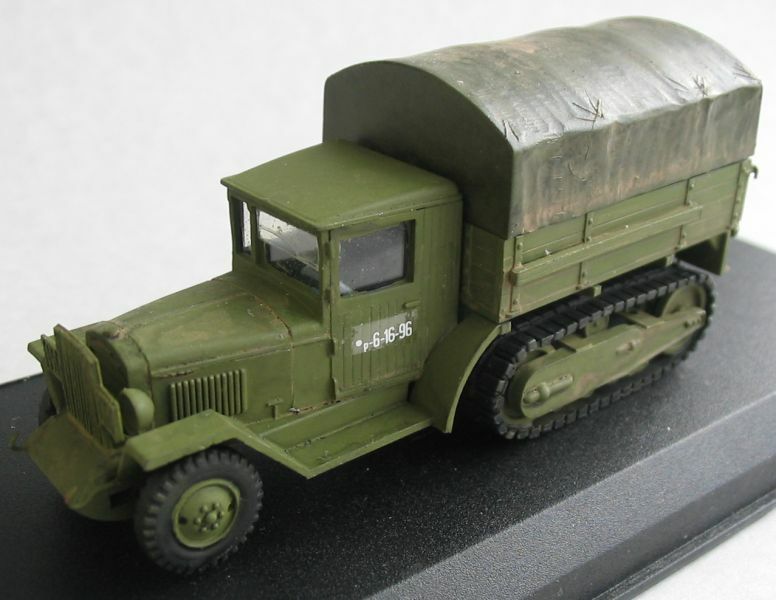 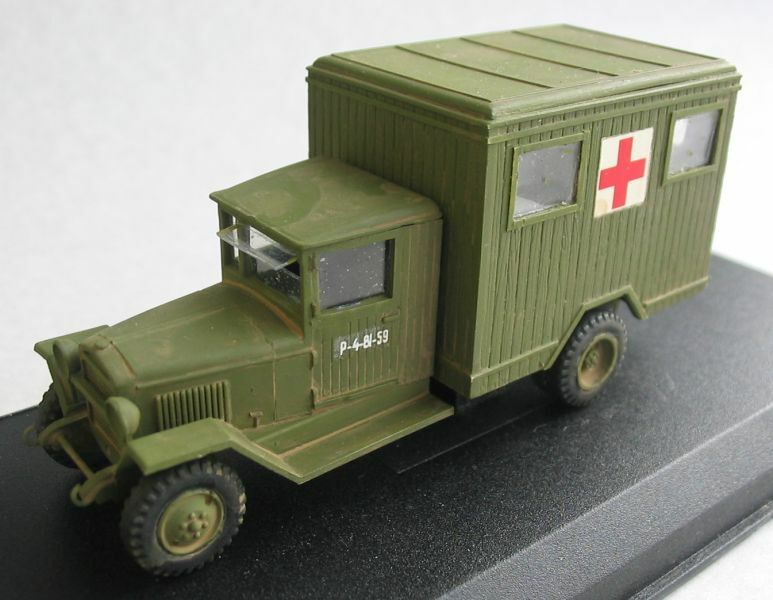 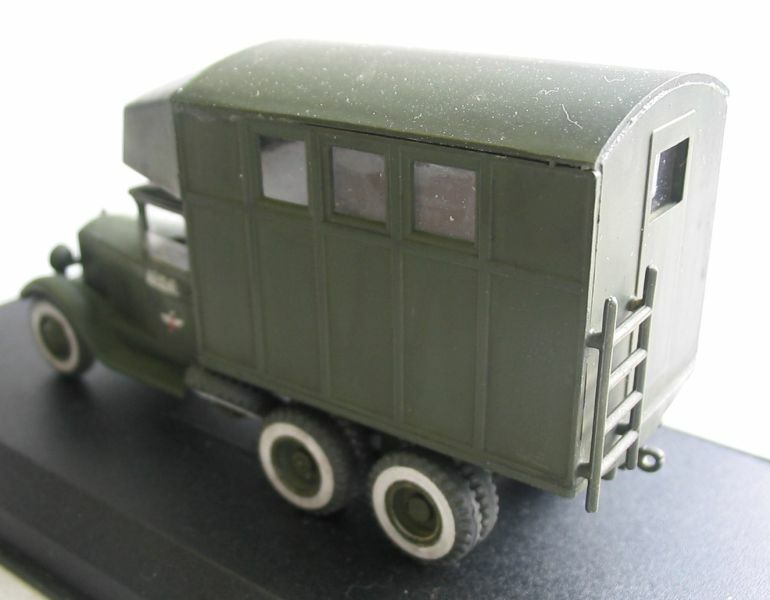 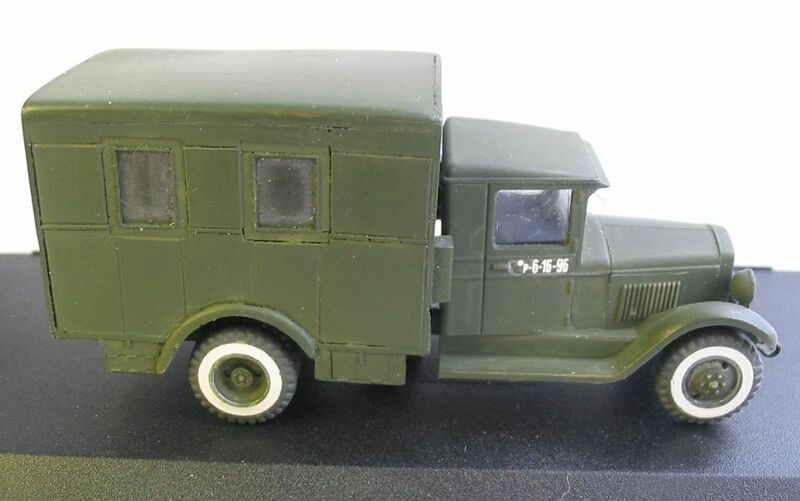 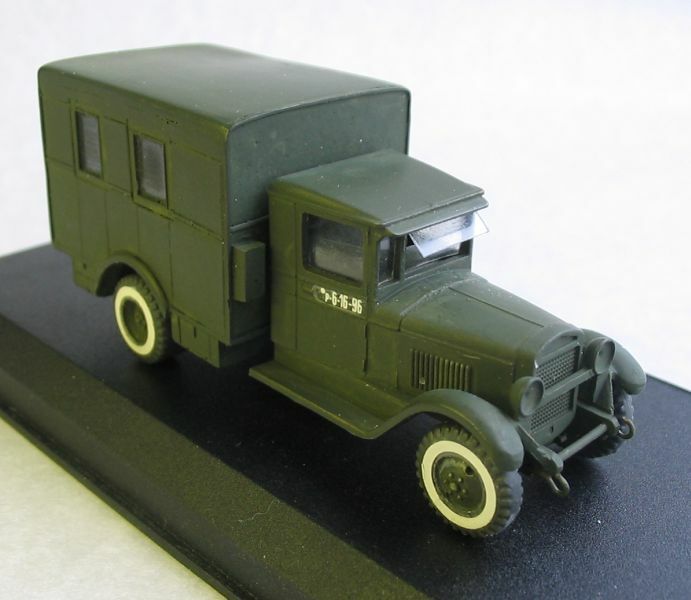 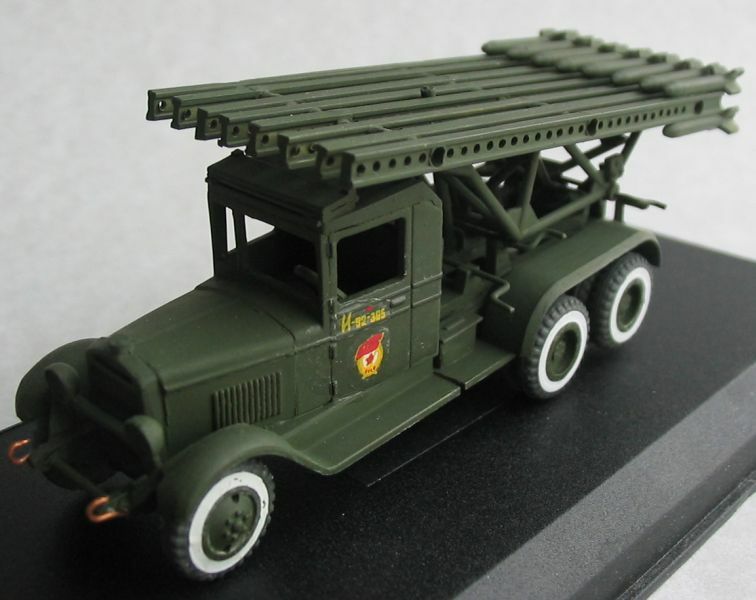 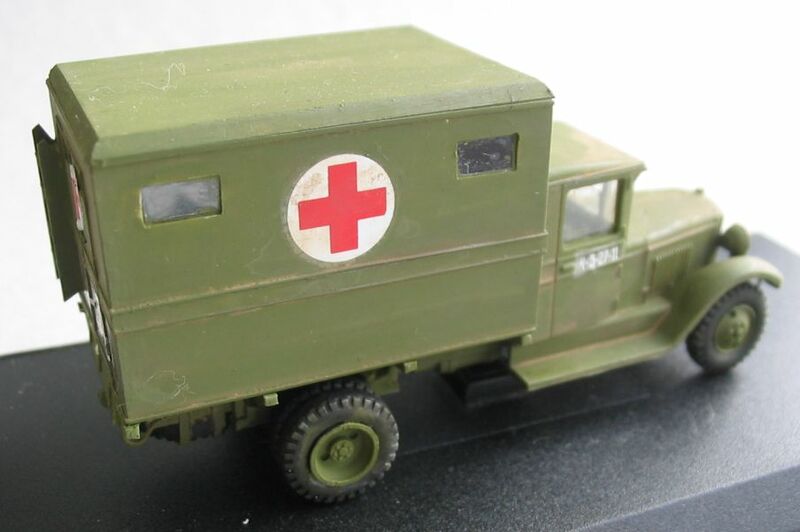 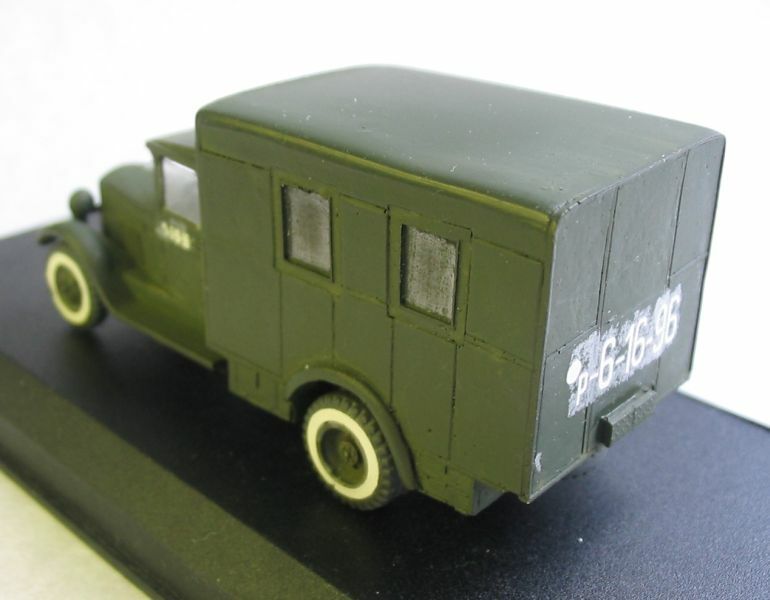 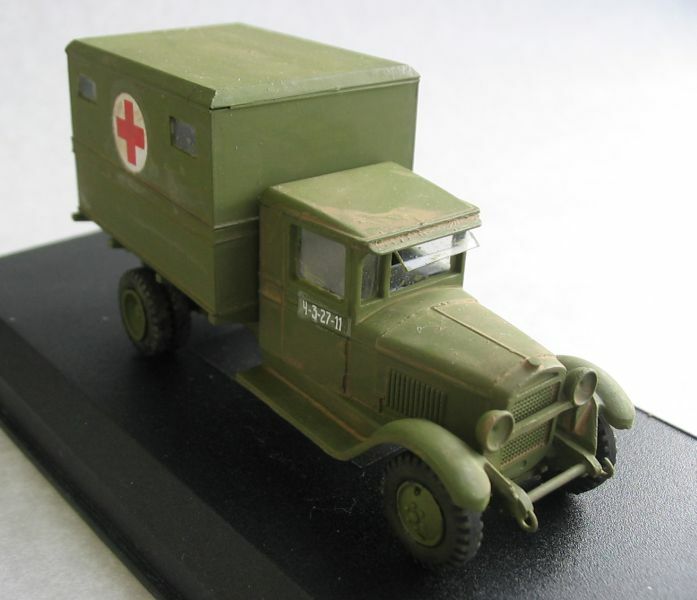 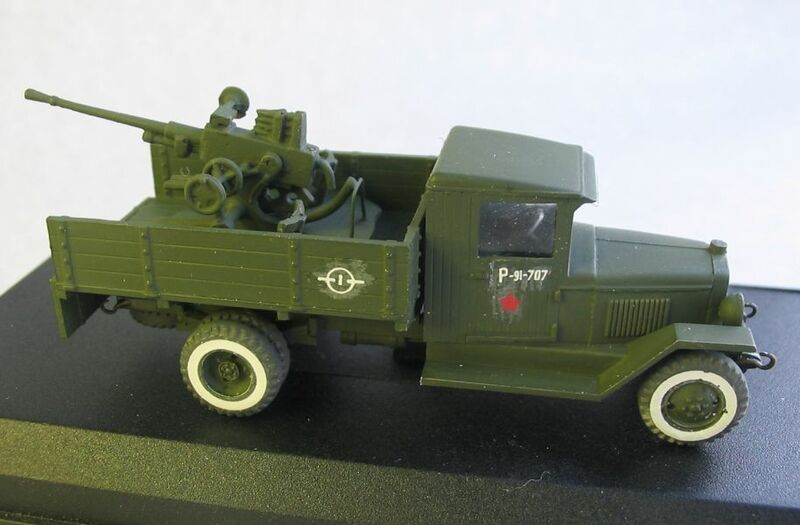 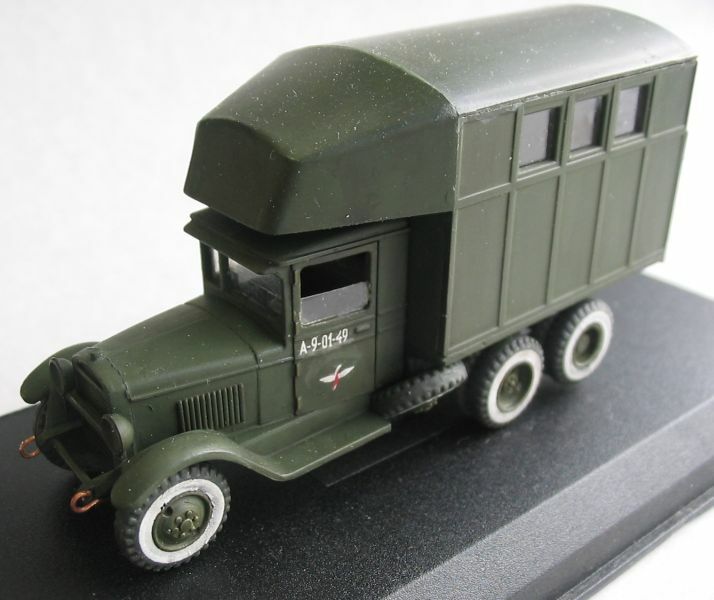 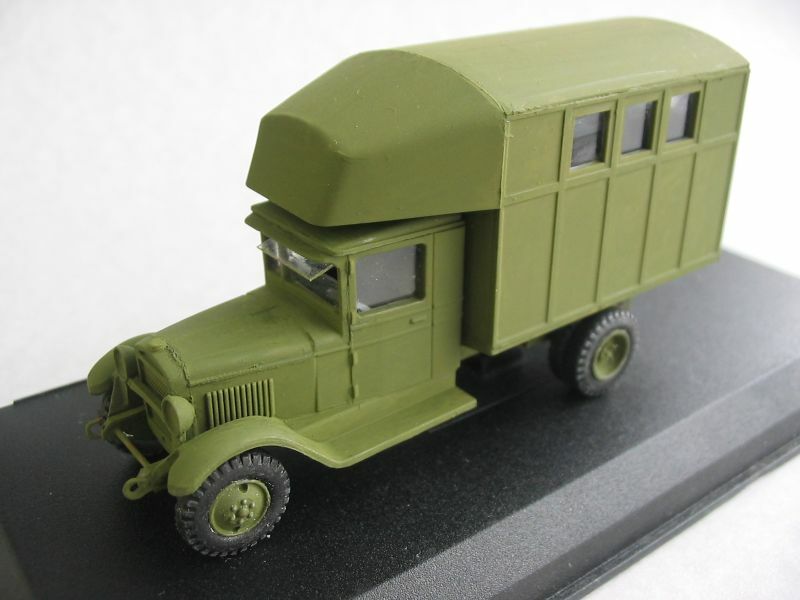 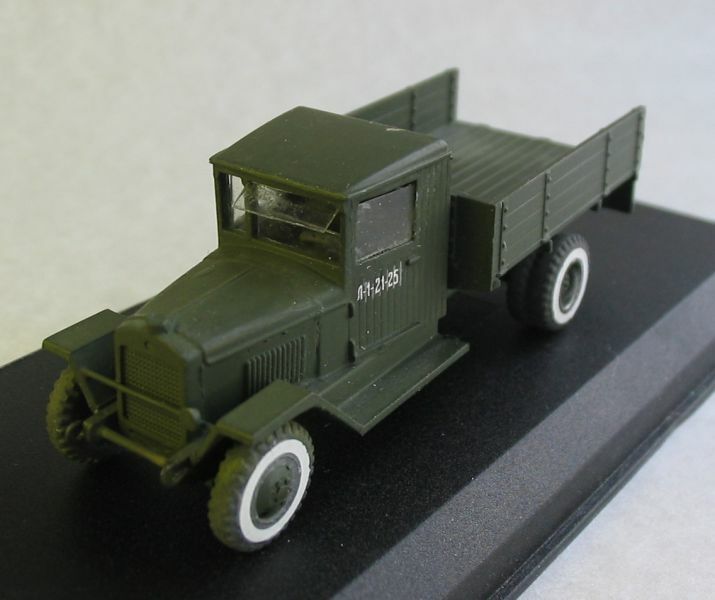 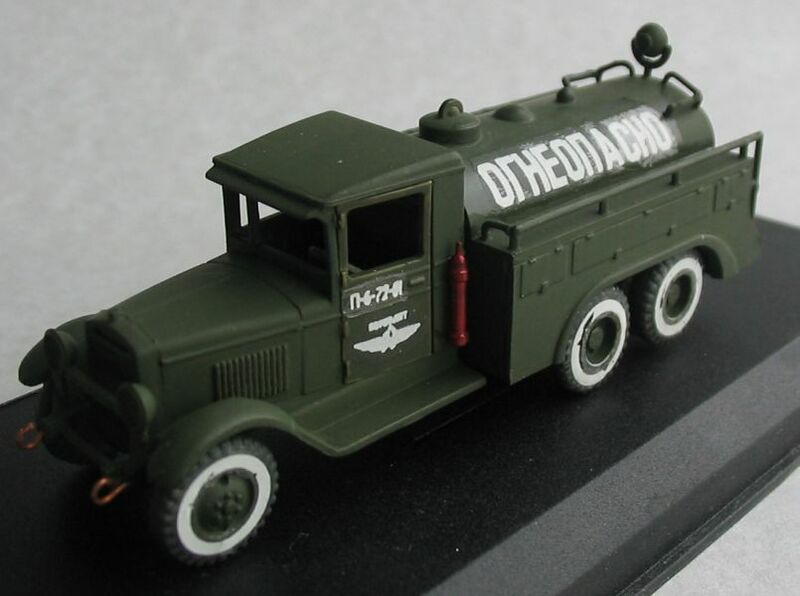 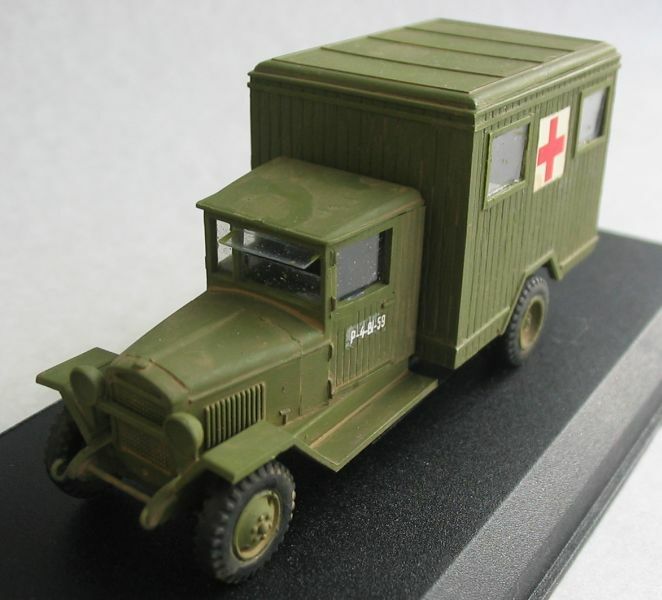 "Russian Scale Models" is a Illustrated Online Catalog, from Metall Diecast Models Scale 1/43 and shows not alone "Military Models World War II", but also postwar and models in all other catagory's, so as airplanes, ambulances, cars, busses, Figures, Fire Fighting, ships etc. 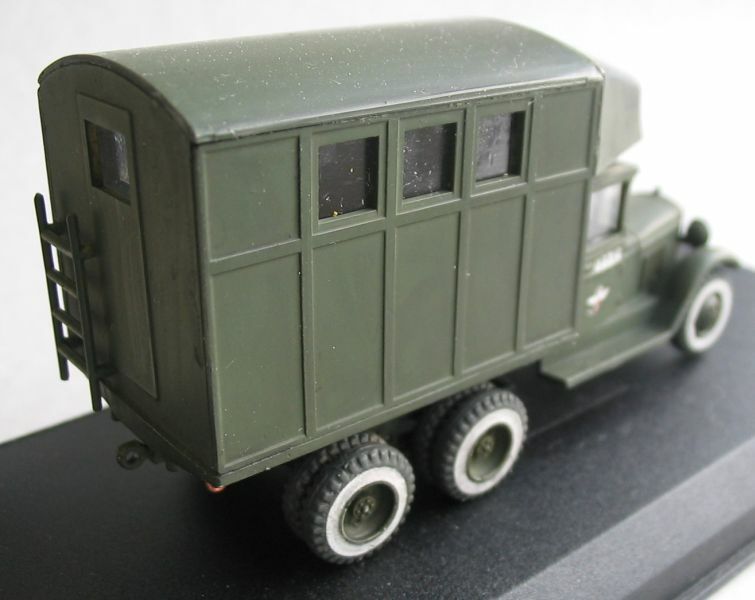 For more information visit the web-site! 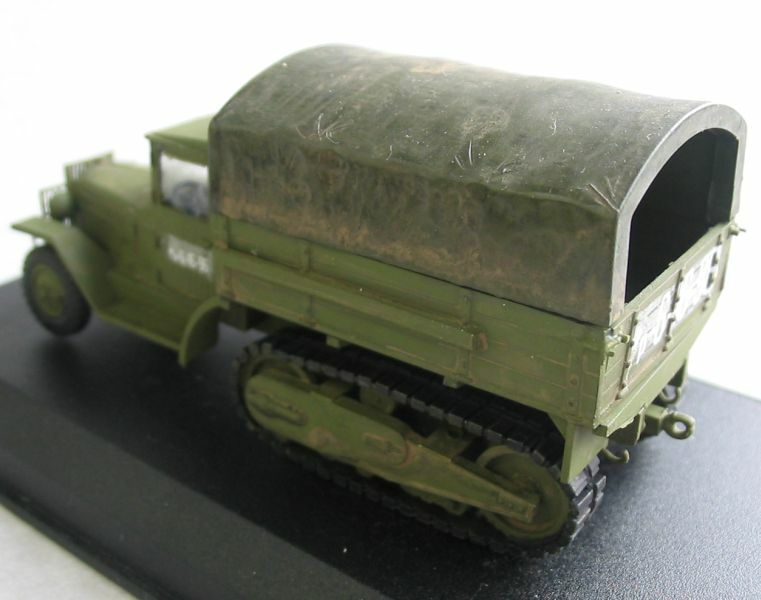 The pictures shows the differents of all variants and give information to inspiration for the modeller.